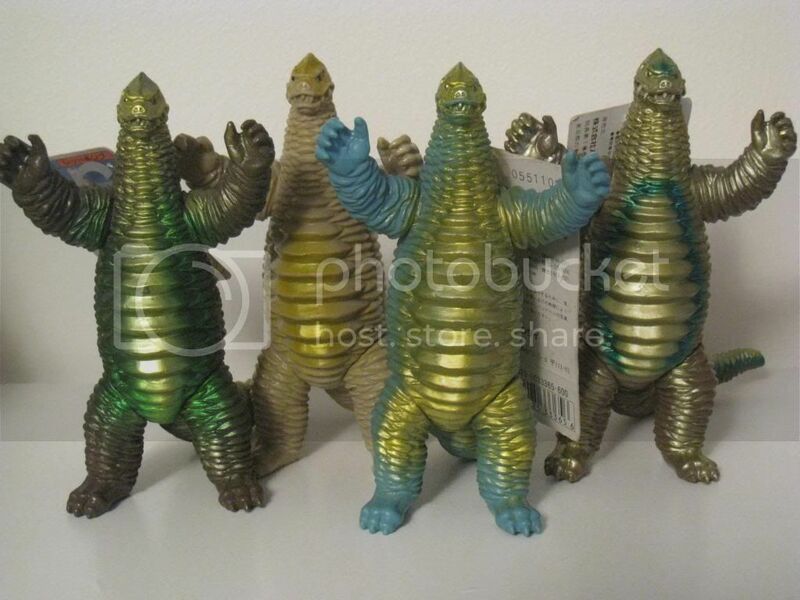 Everyone collects Bandai's Godzilla vinyl line. People write about them, study the various releases and re-releases and there are plenty of English-language databases and lists around for anyone to learn about what's been put out over the years. The same doesn't really exist for Bandai's Ultraman series, whose releases probably number in the thousands by now, easily outnumbering anything they've ever done with Godzilla. 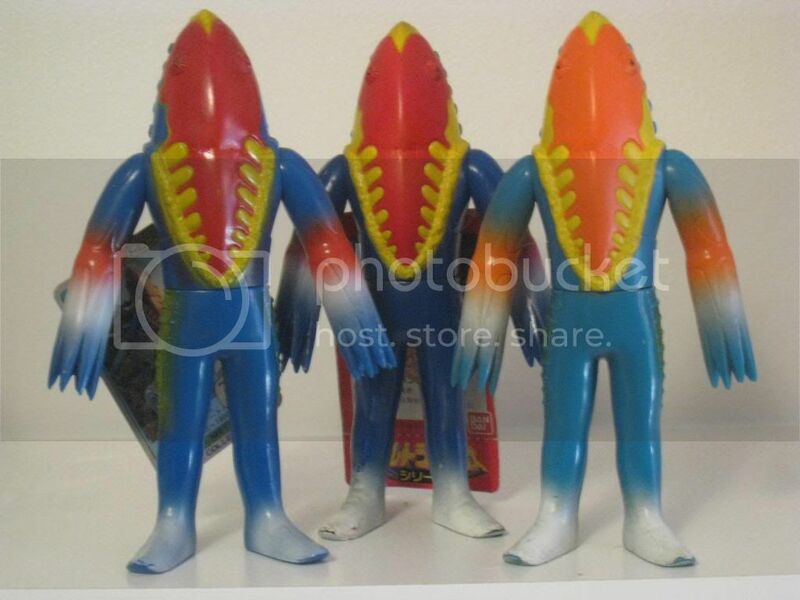 The Ultramonster series in particular has been made available many times over the past thirty years, with new figures constantly being added and many being retired in the process. It's a daunting task to keep up with it all. It's even harder to sort out the various releases of each individual figure. Some of the oldest sculpts have been made available seven different times, and many are difficult to tell apart unless they're found with their original packaging. I suppose it's necessary to start at the very beginning. Bandai's first assortment of Ultra heroes and monsters started to be released in 1983 under the all-inclusive "Ultra Collection" banner. 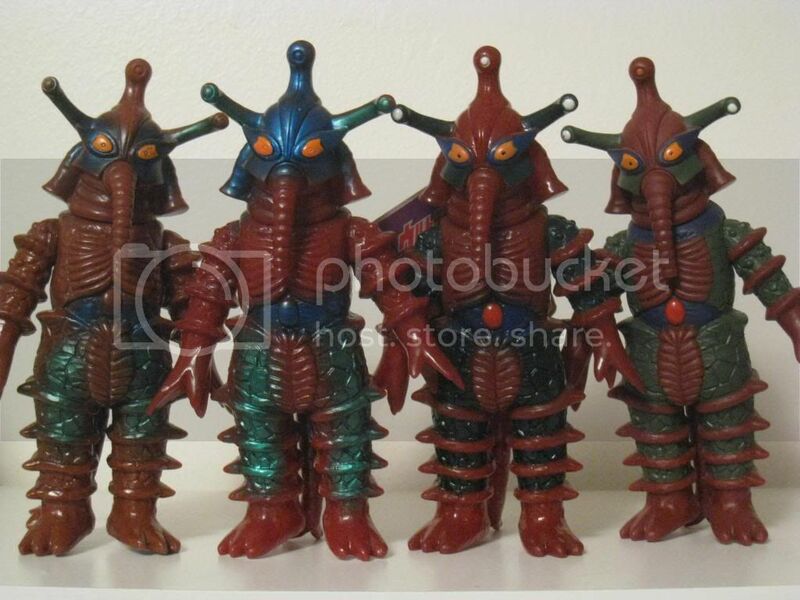 41 different Ultramonsters ranging from Ultra Q to Ultraman Taro were released over the course of about two years. 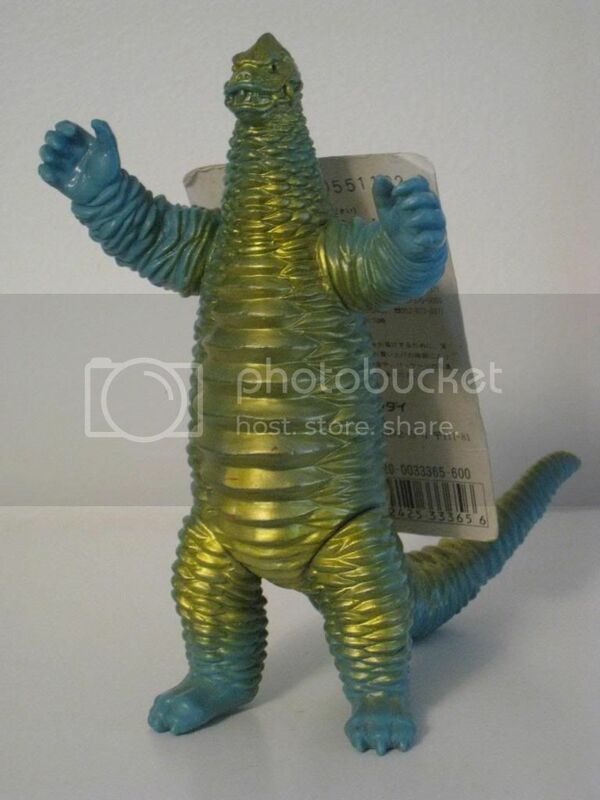 Much like the earliest Godzilla figures, these figures were all sold with small, laminated cardboard tags attached to plastic hangers. Each tag depicted a photo of the Ultra hero from the series they were from on the front while the back displayed a photo of the monster, along with their name in Japanese and English, their episode number, statistics and figure number. 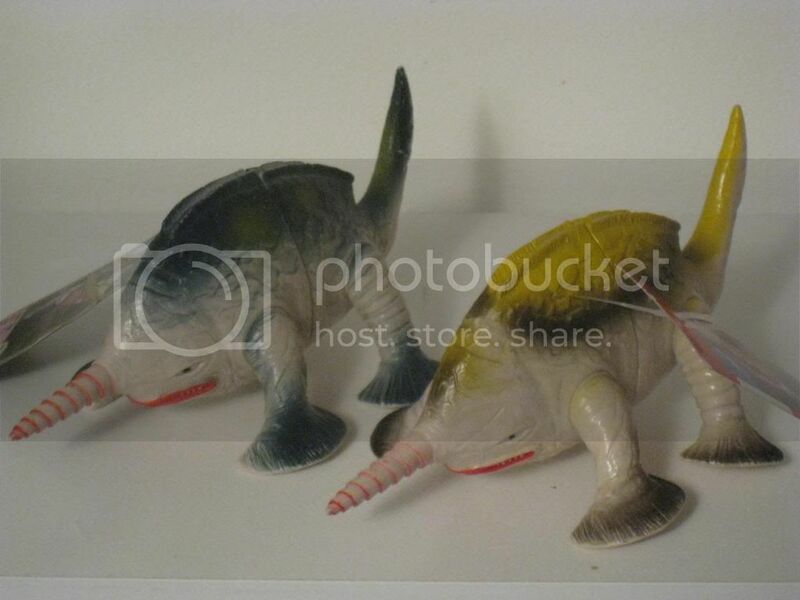 Gudon and Twin Tail would be unique to this line until 1989, until they were made available again with sculpting differences, making the original releases far more sought after and expensive as a result. Aboras, meanwhile, wouldn't be re-released until 1992. Excepting a limited edition release in the early '90s, Grand King wouldn't be widely re-released at all until 2009, making the original release one of the most sought after figures in the entire series. Starting in 1986, Bandai began releasing the figures again, this time ditching the tags for a plastic bag and generic header card titled "The Ultramonster Collection". 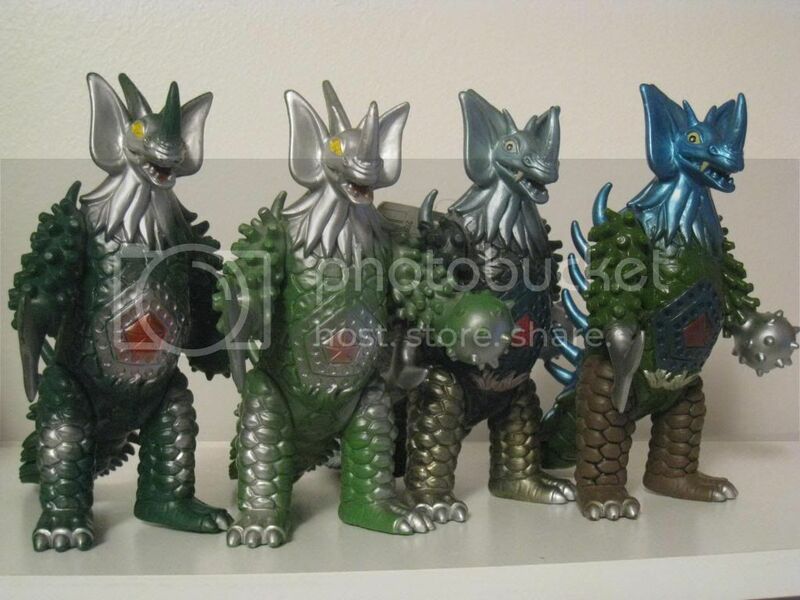 The one new addition to the line during this assortment was the monster Kemular, which was based on a mold originally released by Bandai's subsidiary Popy. 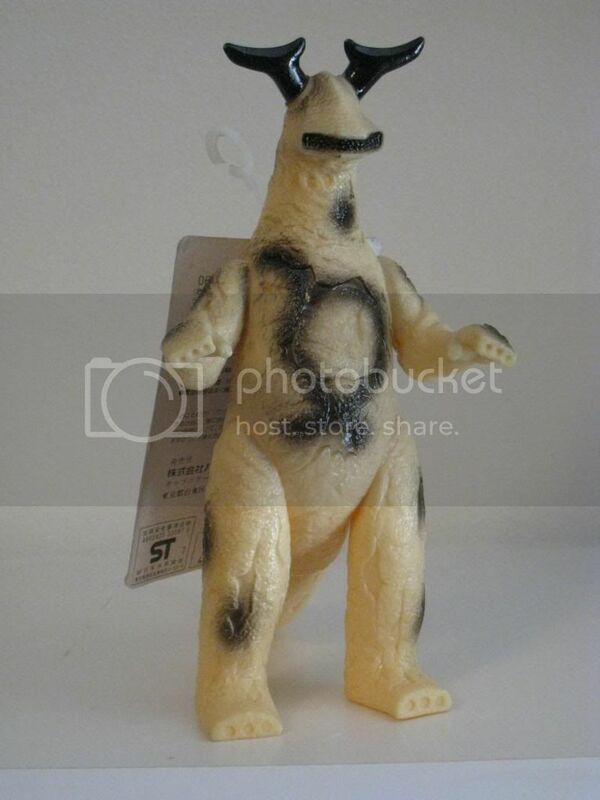 The "1983" on the figure's foot indicates it may have originally been intended for the first "Ultra Collection". None of these figures were numbered. Almost 30 years later these figures aren't often sold in their bags, making it easy to confuse loose samples with the earlier toys or later issues. The only way to tell for sure that they're part of the 1986 assortment would be to check for the lack of a tag hole. In 1988 Bandai put out a box set of figures similar to the Memorial Box sets they'd later issue for the Godzilla series in 1995 and 2005. This box (red with black silhouettes of various monsters and an image of the original Ultraman in the front) was crammed full of 49 figures, including all the heroes and monsters they had released thus far - again not including Gudon, Twin Tail, Aboras and Grand King. Also attached to each figure was a small square tag with a red border and the image of the Ultra family. The entire box set is very hard to find and even loose, tagged figures are difficult to track down. Like before, untagged figures are so similar to the first two collections and later figures that without the tags they're impossible to tell apart. 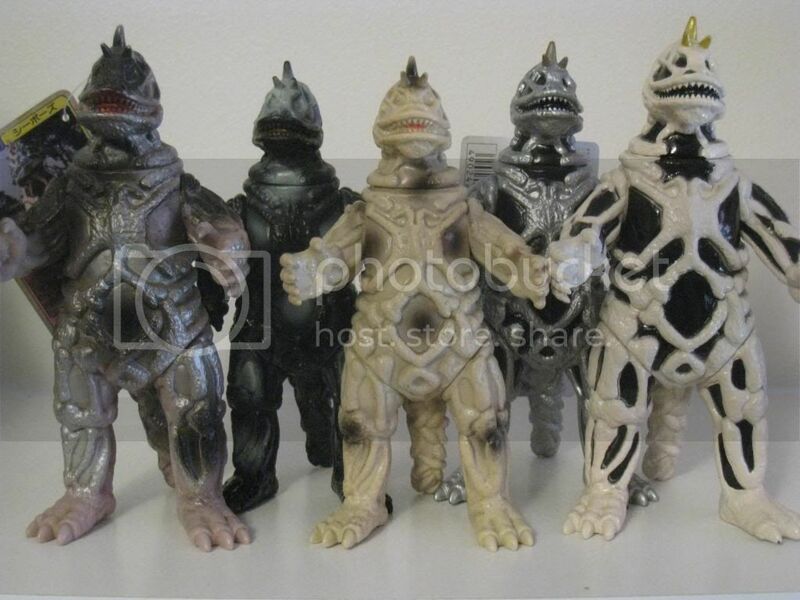 In 1989, Bandai refreshed the "Ultramonster Collection" and started all over. Everything that had been available in the 1986 assortment was issued yet again. It was at this point that Twin Tail (featuring an all-new simplified sculpt) and Gudon (with shortened horns and arm whips) returned, remaining fixtures of the line in its various releases to this day. It's also with this line that Bandai finally began adding brand new characters to the collection. 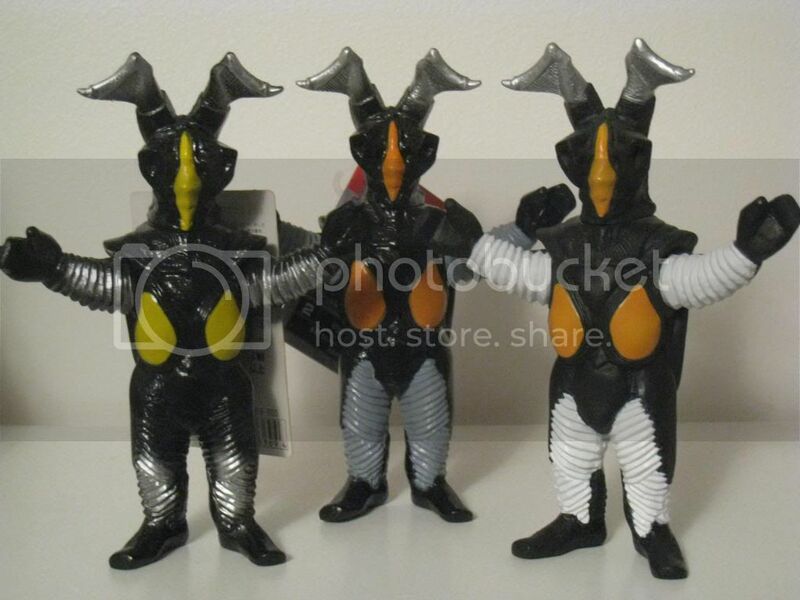 Popular characters from Return of Ultraman, Ultraman Ace and Ultraman Taro debuted here, while Bandai finally turned to the later shows Ultraman Leo and Ultraman 80 to feature characters like Satan Beetle, Ron, Salamandora, Gamaira and Gykogyler. 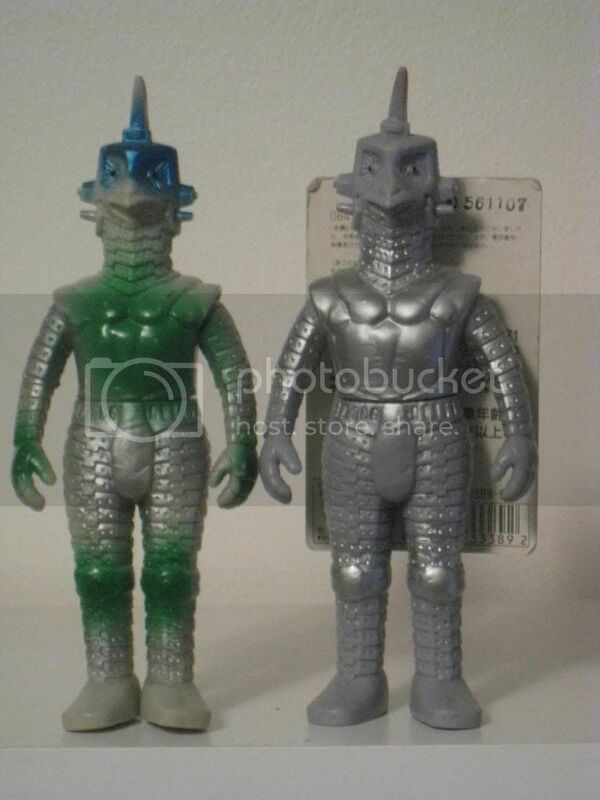 This collection also represented the first real time Bandai would tie new releases to a current Ultra series, as Kilazee and Bogun - characters from the Australian produced "Ultraman, Towards the Future" (known in Japan as Ultraman Great, and having just arrived there on video) - made their debut. 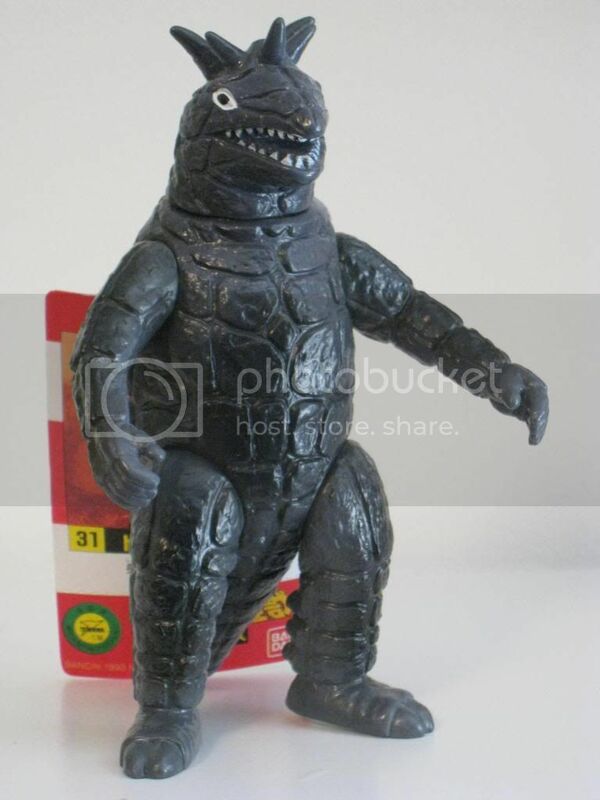 Finally, the tags were re-designed, looking very familiar to anyone who collected the "Destroy all Monsters"-tag Godzilla figures from the same period. The rectangular tags were red in color and featured another generic image of the Ultra family. The bottom section of the tag is perforated, with the "Ultramonster Collection" printed on the front and the each monster's name on the back. This would be the very last time the tags were not numbered. And now we come to the subject of this overview. In 1991 Bandai started from scratch yet again in what would eventually grow to become the fullest and easily the longest-lived incarnation in the series' history. Initially, everything was re-released all over again. In many cases, the vinyl color and/or paint applications on these new releases would be very different from the previous figure assortments, making most of this line quite distinct from previous issues. The length of time a lot of these figures were kept in production also insured that the majority of them ended up becoming relatively common, and quite a few of them are still easily found with tags attached. In addition, Bandai's switchover to softer vinyl and the farming out of production to China happened during this time, so many figures can be found made of both hard or softer material, as well as different imprints on the feet. The tags were now wider than before, and each one featured a photograph of the monster they belong to, along with the monster's name, statistics and figure number. Worth nothing is that the earliest releases of these figures were not numbered, something that didn't seem to last very long. The perforation is retained and, while the front still features the "Ultramonster Collection" title and copyright information, the reverse side now includes the barcode and other information. A brand new feature - one that would carry on to this day with a few alterations - is the inclusion of a thick colored stripe behind the photo of the monsters, which corresponds to which series it appeared in. For the record, the colors for the 1991 releases were purple (Ultra Q), red (Ultraman), dark blue (Ultraseven), orange (Return of Ultraman), light blue (Ultraman Ace), green (Ultraman Taro), purple (Ultraman Leo), yellow (Ultraman 80) and teal (Ultraman Great). Many new characters also made their way into the line at this point, including several that are entirely unique to this series as well as Aboras, who had not been seen since the early '80s. Also worth pointing out is that there is no figure #41 in this collection. At least one Japanese guide lists #41 as Takkong. 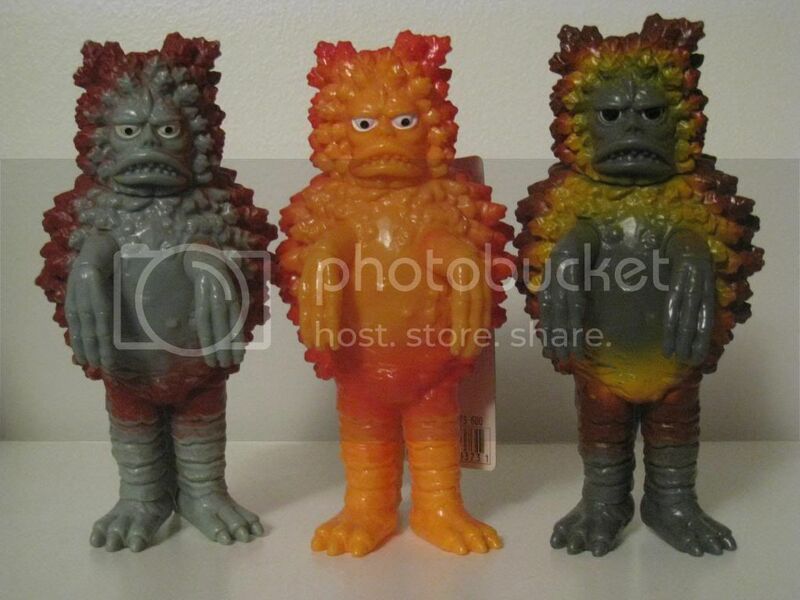 While a limited edition Takkong figure (molded in purple) was made available during this time, one was never added to the standard, numbered series. In all, the numbers for these releases ended at #70, including the missing #41. Finally, mention must be made of the direction the line started to take in 1994, when Bandai began retiring older sculpts, replacing them with updated molds and giving certain figures full repaints. Seven figures were re-sculpted, thirteen figures were given new paint jobs and Takkong took its place as figure #41. All twenty-one of these figures were given a brand new, thinner tag design that would apply to all new character released until 1996, when the tags were re-shaped again and lost their perforation for the new Ultraman Tiga figures. This tag design lasted until May of 2000, with a whopping 140 individually numbered figures having been released. Throughout this all the other figures who had not been updated with new sculpts or paint jobs were kept in production as-is, with their original 1991-style tags. 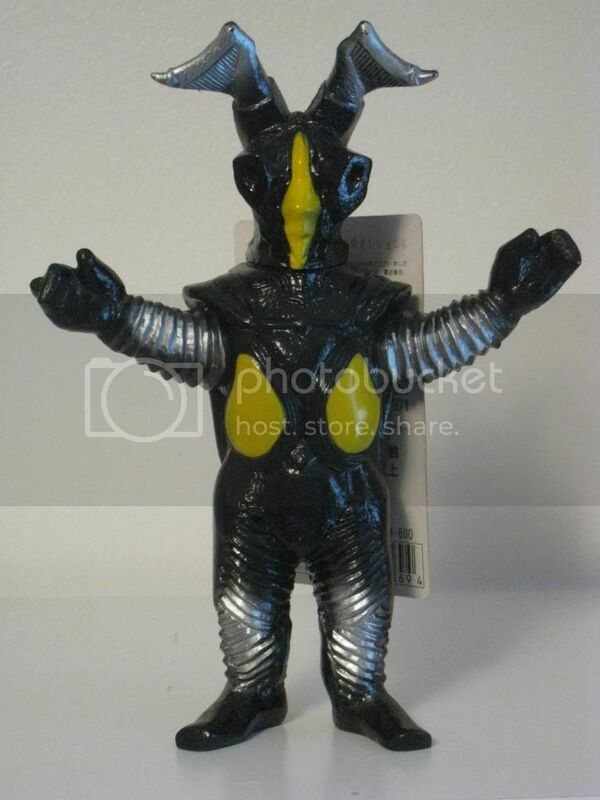 What this basically means is that even as late as 1998/99 it was still possible to buy a Garamon figure with a 1991 copyright on its tag, while Bandai was also producing brand new characters from Ultraman Gaia or Dyna complete with the newer tag designs. Last edited by Legion on Sat Mar 09, 2013 10:31 am, edited 1 time in total. Even though I am not an Ultra-collector, i am looking forward to seeing updates in this thread. I was going to reply right when you finished posting all this, but then stopped myself because I thought you were going to begin with the pictures then and didn't want to interrupt. Now I don't remember exactly what I wanted to say before. I don't know exactly what it is that made you want to narrow your focus to 1991-93, but it's a great choice. 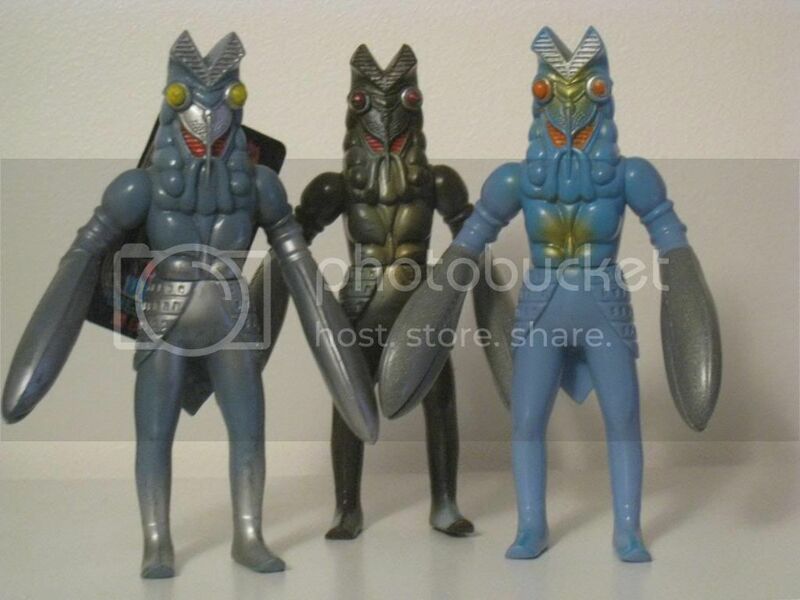 Of all the periods of Ultraman figures, it's one of the most relevant to us because they're some of the most common figures, but it's also so poorly documented. A lot of things about the Ultra Monster Series seems to be, as I haven't heard of some of these unnumbered tag periods you mentioned before. Was never going to happen, but I really wish that Ultraman collection book I've got was in English too. Would've made perusing it more enjoyable. And so we begin. Each day I'll post three new figures starting with their figure number, name, a photo and then a brief description of the toy and what makes the 1991-1993 release different from earlier and later releases. If anyone has a way to expand on this please let me know. 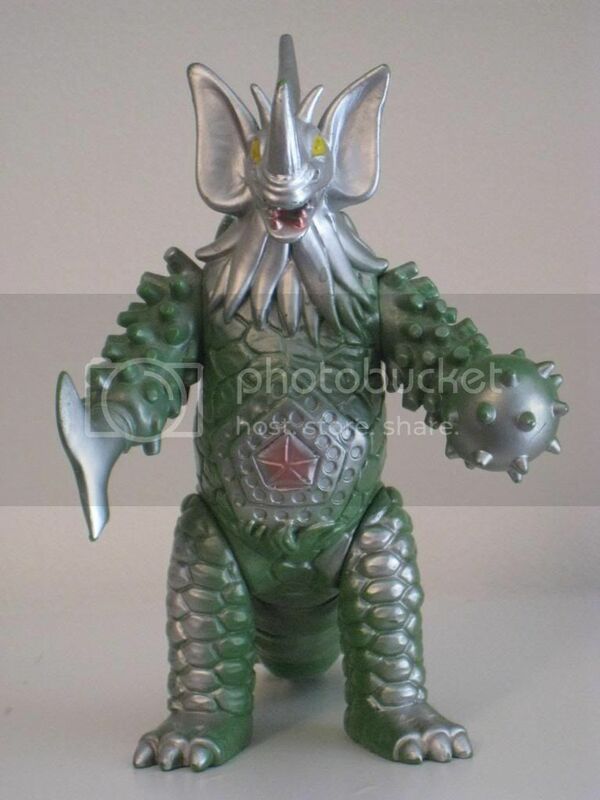 As he would do in every subsequent Ultramonster assortment, Baltan kicks off the 1991 figure series. By now this mold had been used four times previously, with this release being the final time it was utilized before being replaced in 1994. 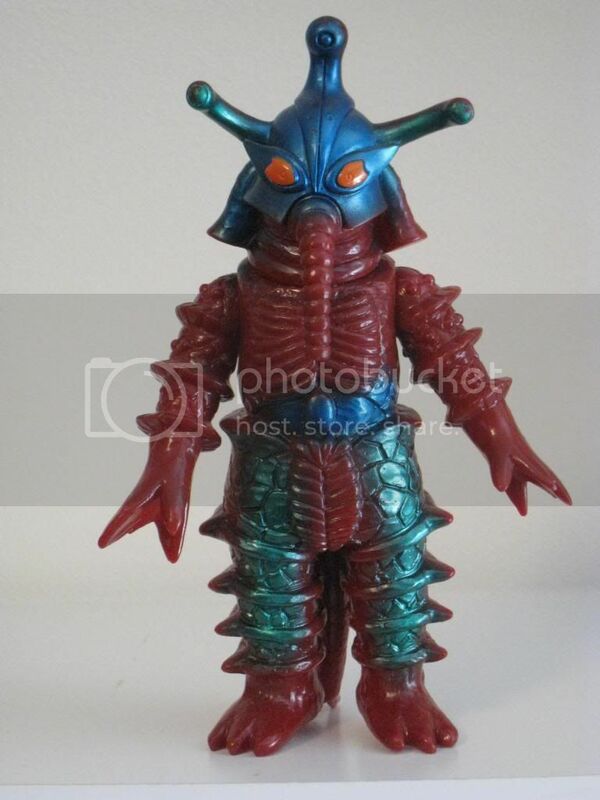 Most earlier Baltan figures had been molded in brown, but this one goes back to a blue vinyl, making it similar to the original 1983 release. The figures are still easy to tell apart even without tags. 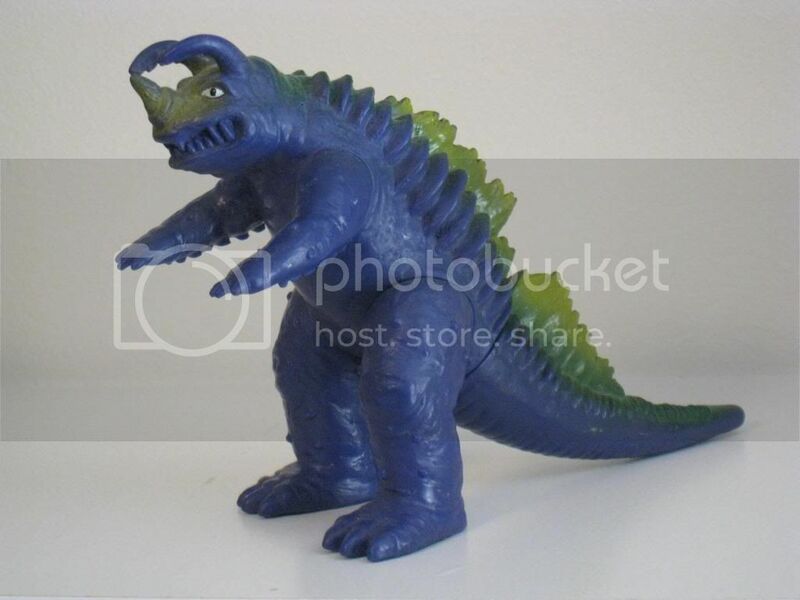 The 1991 version is made of a brighter blue vinyl, lacks the silver highlights of the original, has orange painted eyes instead of yellow and the claws are made from glitter-embedded grey vinyl. The original Red King was cast in brown with gold and green highlights. All later '80s releases were light tan with gold highlights. This release distances itself from all of those Red Kings by being the only time this mold was released in blue vinyl. There is a known - and relatively common - bootleg of this toy with the same color scheme. The easiest way to tell that one apart from the legit Japanese figure is by horns on the head of the boot. Despite the colors, there should be no mistaking it for the real thing. Black King presents one of the biggest headaches for anyone trying to put together a full Ultramonster collection consisting of figures from various release assortments. The 1988 Ultrabox, the 1989 release and this figure are ALL cast in a dark grey vinyl and attacked with gold paint of various intensities. Anyone dealing with these figures without tags is going to have a hell of a time telling each release apart. Comparing this one with earlier releases reveals a lighter base vinyl and less gold paint. 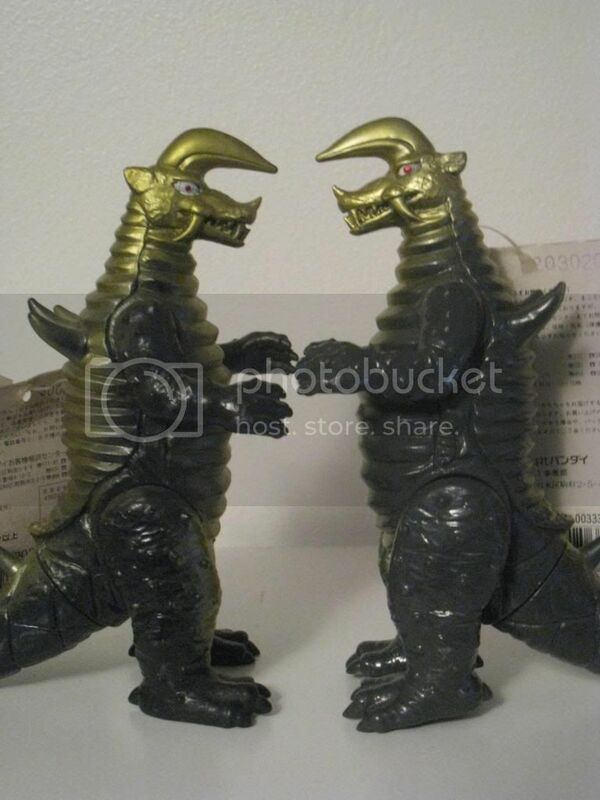 Comparison of 1989 Black King with 1991 Black King, showing differences in vinyl color and paint. Last edited by Legion on Mon Feb 25, 2013 7:41 pm, edited 1 time in total. I had the 1991 Red King for the longest time. I always thought I had one with extreme "paint wear" because of all the blue (and because I saw a later release that was all gold). Glad to know it wasn't just mine. This is a neat thread, nice work! I really like the comparison pictures. Thanks for putting so much effort into this topic. I'm starting to feel the same way. 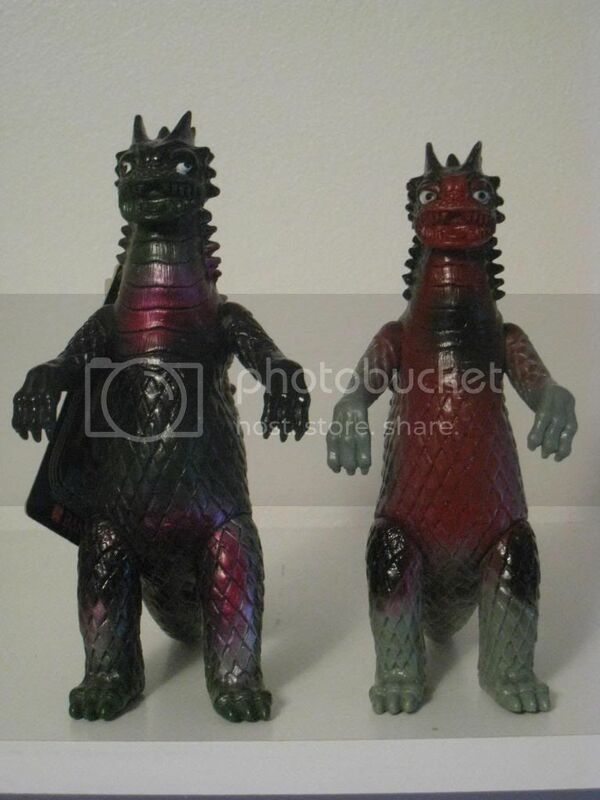 You have a bunch of Bandai Godzilla figures? Whoopie. Want to REALLY impress me? Show me your complete set of '83-'84 plastic tag Ultramonsters, or your 1988 box set, or some of those early '90s anniversary exclusives, or the Japanese-tag Dreamworks figures, or a complete Ultraman Powered set, or a full set of boxed 1984 giant-sized figures...I could go on. Yeah, even if they just have a really nice collection of everything 2005 and onward I'm more impressed than I would be with a pretty decent sized Godzilla collection. 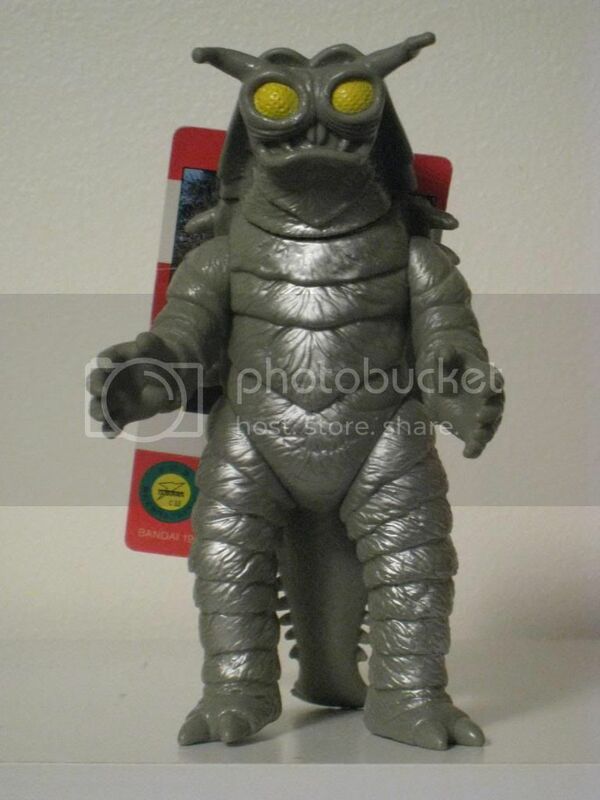 I mean, watching Ultraman kaiju figure reviews makes me feel all warm and fuzzy inside while watching a review about Godzilla or Gamera kaiju just make me go "that's cool." 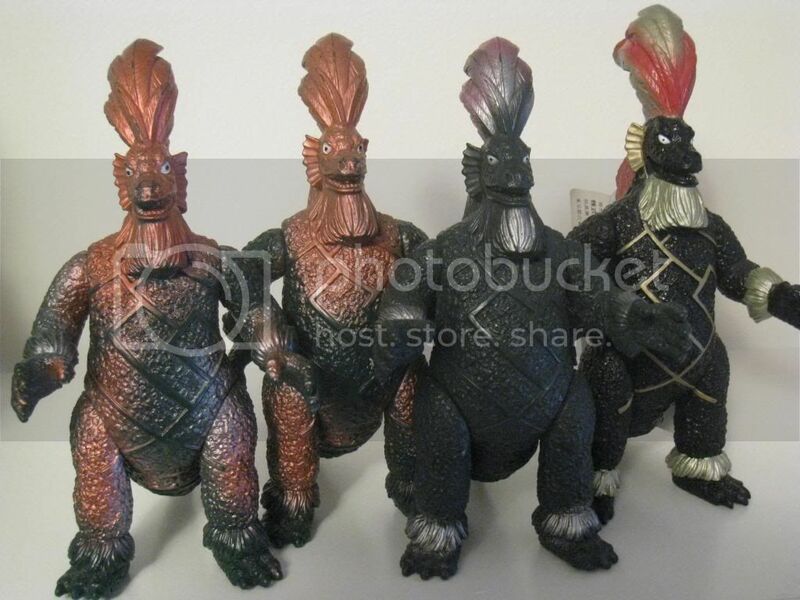 I think it's all about variety and the Ultra kaiju have it in spades. 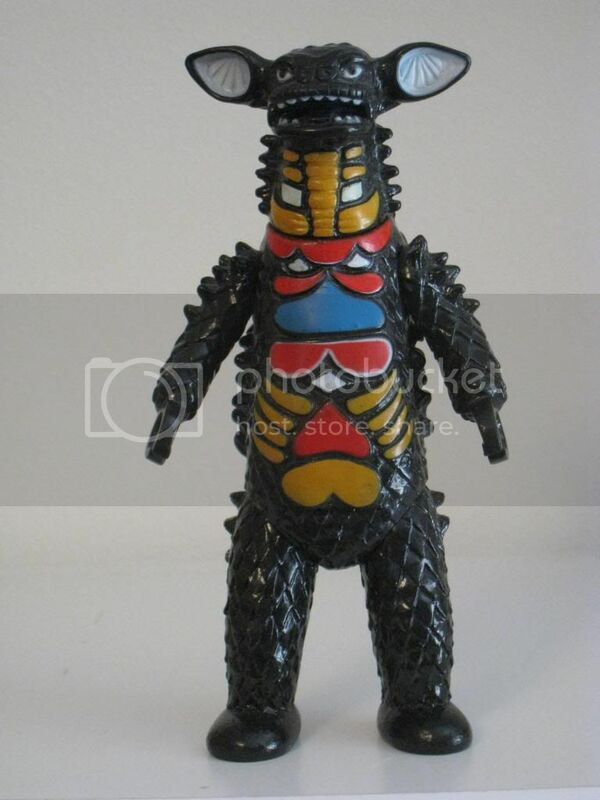 There's just something "fun" about a really well made Ultra kaiju. 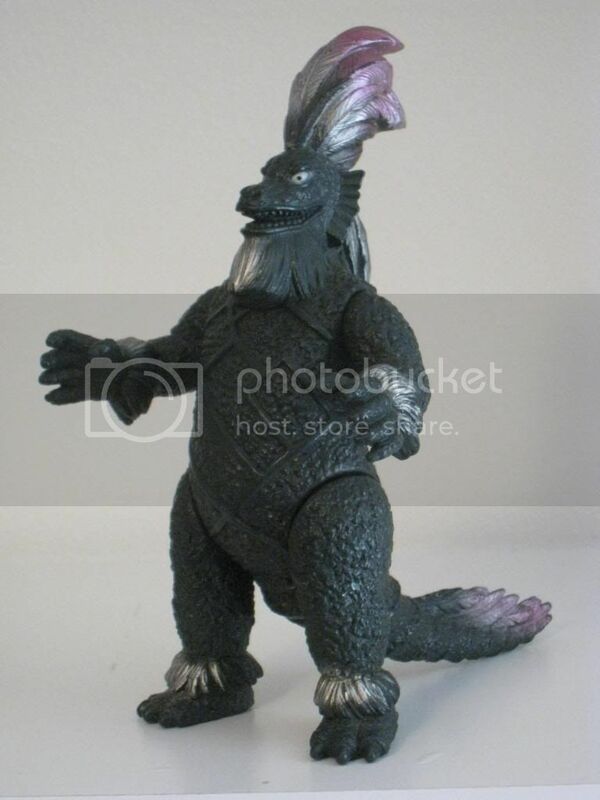 This is very different from how I felt years ago when I thought Ultra kaiju were cheap knock offs of Toho kaiju. 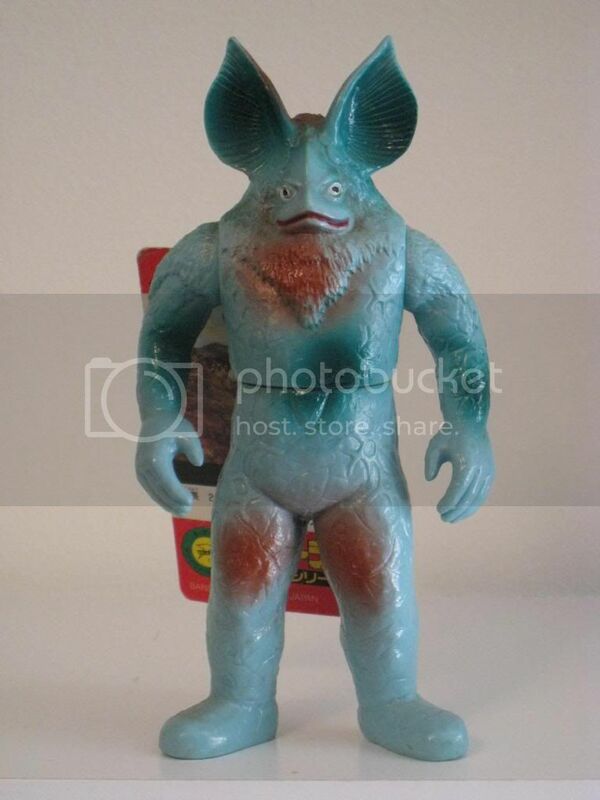 These days, I actually prefer the Ultra kaiju. Eleking is another figure that's very tough to tell apart from earlier releases unless you have the tag. All versions of this toy are pretty much painted the same way, with the actual location of the black sprays varying from figure to figure. For example, my attached tag '91 Eleking doesn't look quite like the figure pictured in the "Figure-Oh Premium Series" book. Finding one with a tag is the best way to insure you're getting the correct figure. 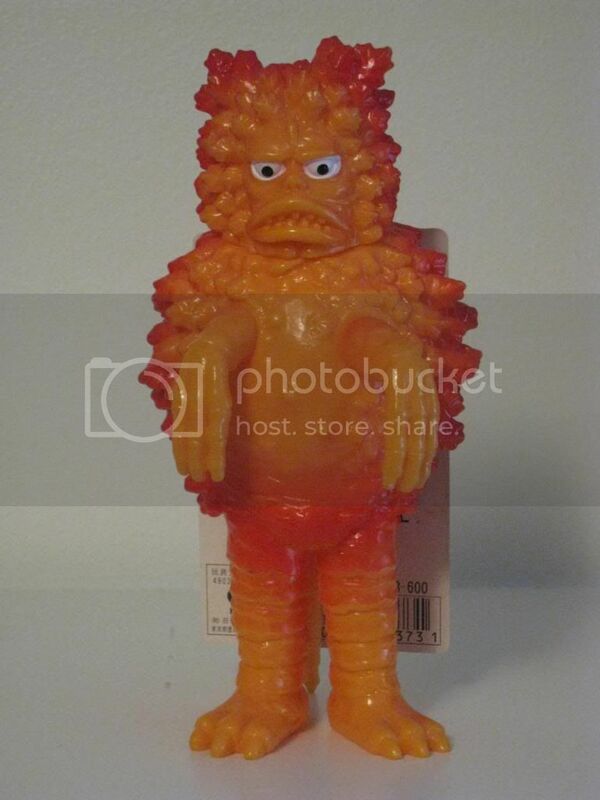 The 1991 Gomora figure stands out by being NOTHING like all other releases of the same mold. 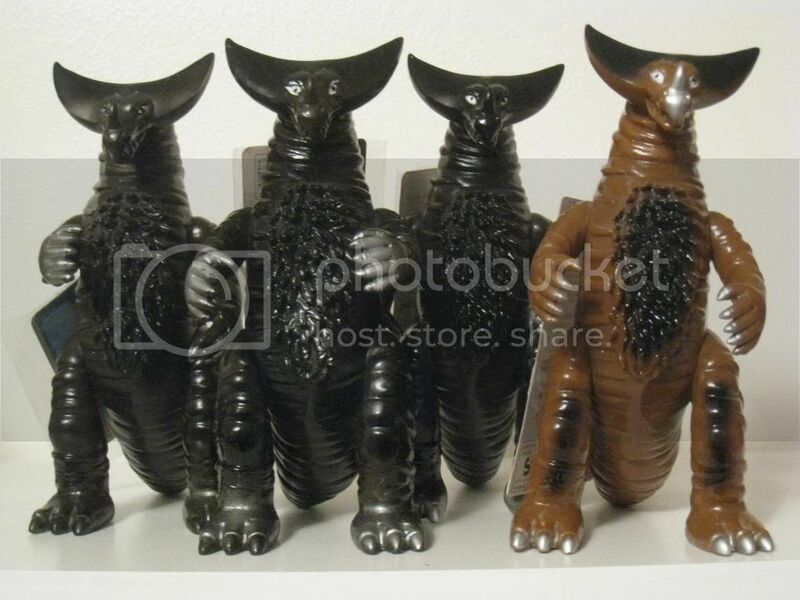 All previous Gomora figures were cast in dark brown vinyl with black and silver sprays. The four previous Gomora releases are almost impossible to tell apart unless they're tagged (and I HAVE every release tagged, or bagged in the case of the 1986 version). 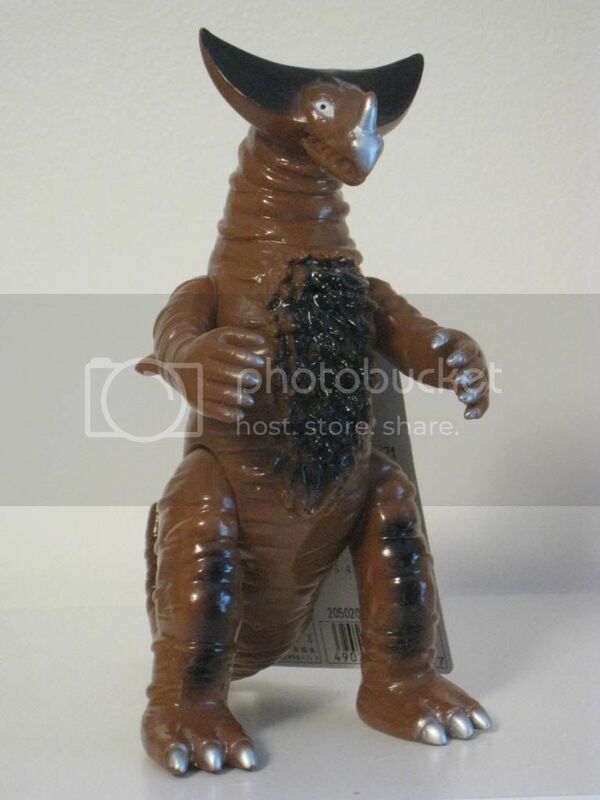 Instead of making things more confusing, the 1991 Gomora is cast from a lighter, chocolate brown vinyl, with black sprays and only minimal silver on the horn, finger and toenails. The result is a cheaper-looking toy than the darker originals, but one that's incredibly easy to tell apart from the others. This was also the very last use of this mold, as a new one was introduced in 2000. Still, this meant that this particular figure stayed in production for almost a decade, making it fairly common. At first glance, the 1991 Z-Ton figure seems hard enough to tell apart from the other early releases of this toy. It wouldn't be until the 2000 assortment when the paint apps would become more elaborate. However, there are a few ways to tell this one apart from the earlier releases. The easiest way would be to look at the color of the chest and face ridge. This is the only one painted a stark yellow, with all the other releases being closer to orange. Additionally, the earlier Z-Tons have a far more generous amount of silver paint applied to the arms and legs. If the paint doesn't extend to the hands, it's most likely a 1991 release. 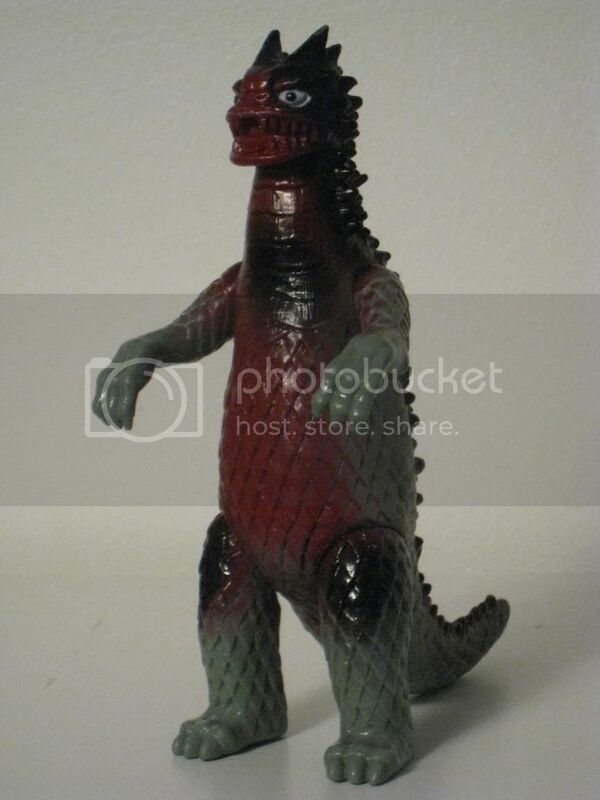 I really like the way the 83 Gomora looks. Good sculpt. The paint is a little bland but for such an old figure, it's pretty solid. 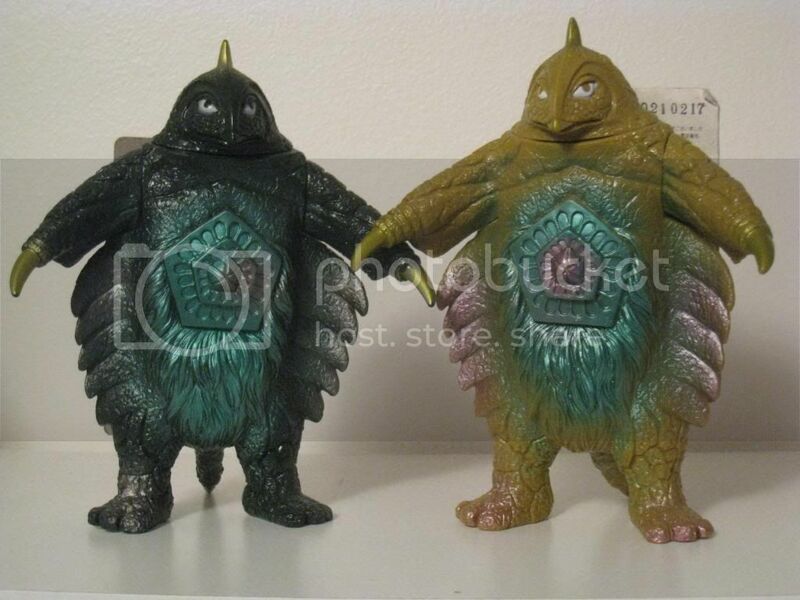 In general, most early Bemstar figures follow the same basic color pattern: dark green vinyl with metallic pink and green paint sprays. Like Gomora, this makes these releases very hard to tell apart unless the tag is present. 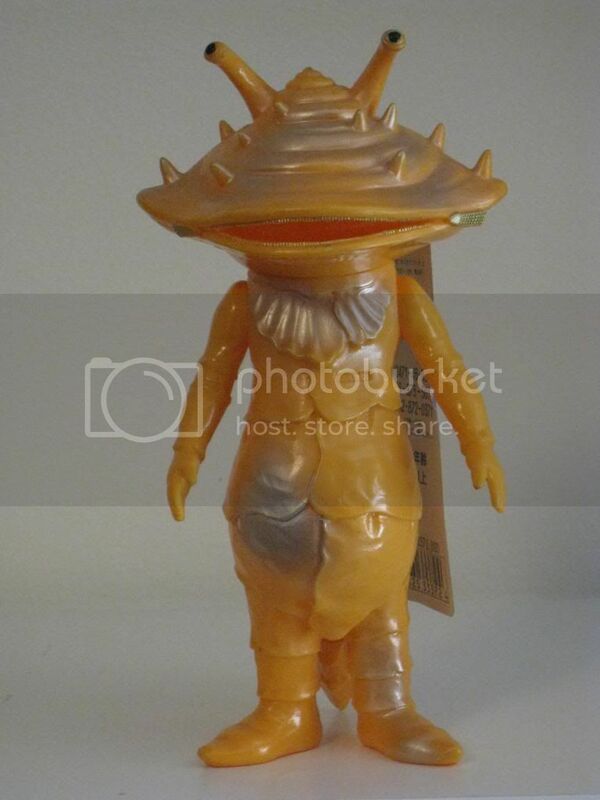 However, also like the Gomora, the 1991 Bemstar goes in a completely different direction with its base vinyl color of light brown. There's a bootleg of this figure too in the same basic color, but with mold differences. The 1991 Tyrant doesn't differ from its earlier releases too much in terms of paint. The best way to tell this one apart from the older figures is the vinyl color, which is a much lighter green. This is one figure that was crying out for a better paint job, which it would finally get a few years later. And with a new Tyrant sculpt finally premiering in 2009, it looks like this long-lived figure has finally been retired. Another example of Bandai going with a simpler and flatter vinyl color compared to the richer paint schemes of the '80s. This figure is cast in a dull orange with a few quick silver sprays. Earlier releases are far more orange in color. 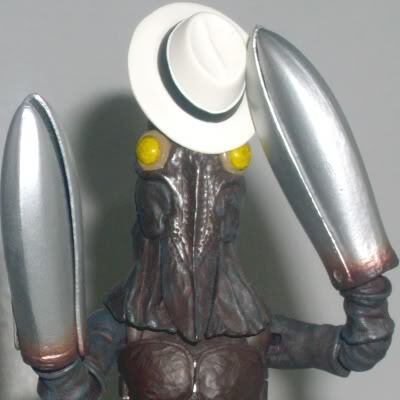 Not really much else to say about ol' clamhead here. 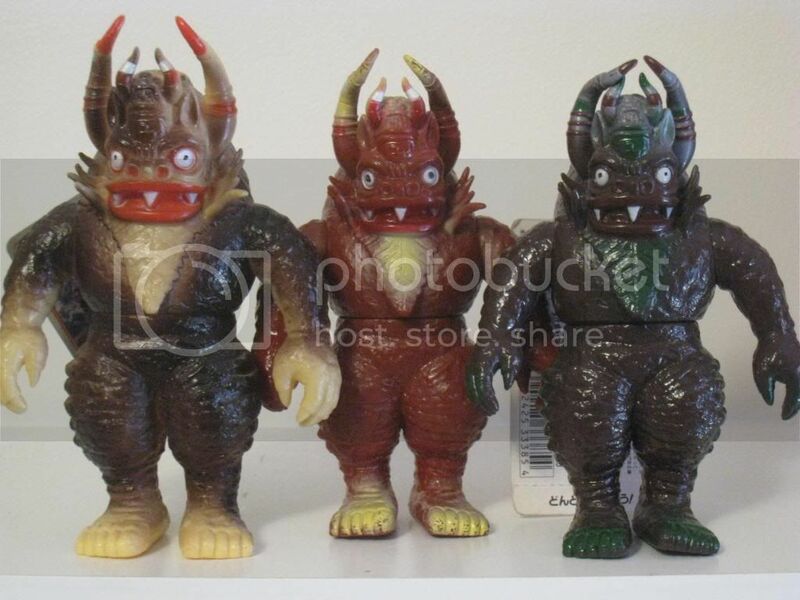 All of the earlier Garamon figures were cast in grey vinyl with dark red/magenta paint sprays. This one is completely different, being cast in orange with deeper orange sprays. The result is a very basic-looking toy. Be sure not to confuse it with the 2007 release, which adds a white spray to the hands, legs and feet. Bandai introduced a brand new Garamon mold in a limited edition Ultra Q box set in 2011, so I would be shocked if we ever see this mold again. 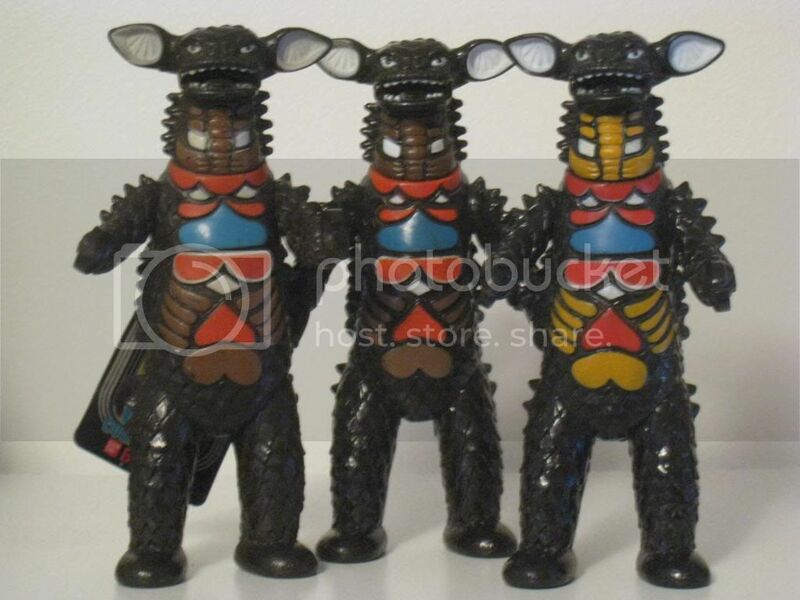 The Hipporito figures of the '80s and early '90s are generally rather difficult to tell apart. It wouldn't be until 2000 when the figure would get more elaborate paint jobs. The best way to tell the 1991 Hipporito apart from the earlier releases is with the vinyl color, which should be a shinier, richer brick red compared to the older toys, with a lot more metallic blue on the entire top part of the head. The 2007 release, meanwhile, is the only one cast in a matte vinyl. The 1991 Antlar is very easy to tell apart from all earlier and later releases. 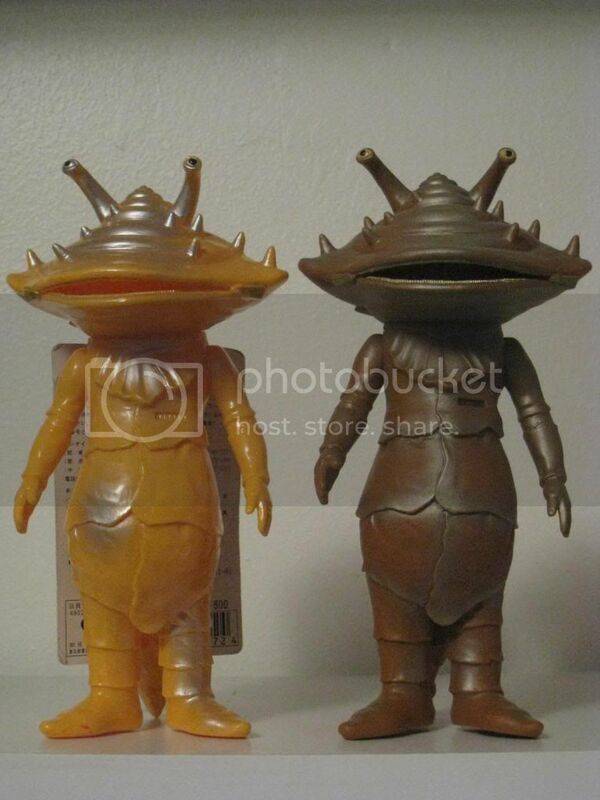 The 1983 and 2000 releases were both cast from a light tan vinyl, while the rest of the '80s figures were all molded in dark brown. 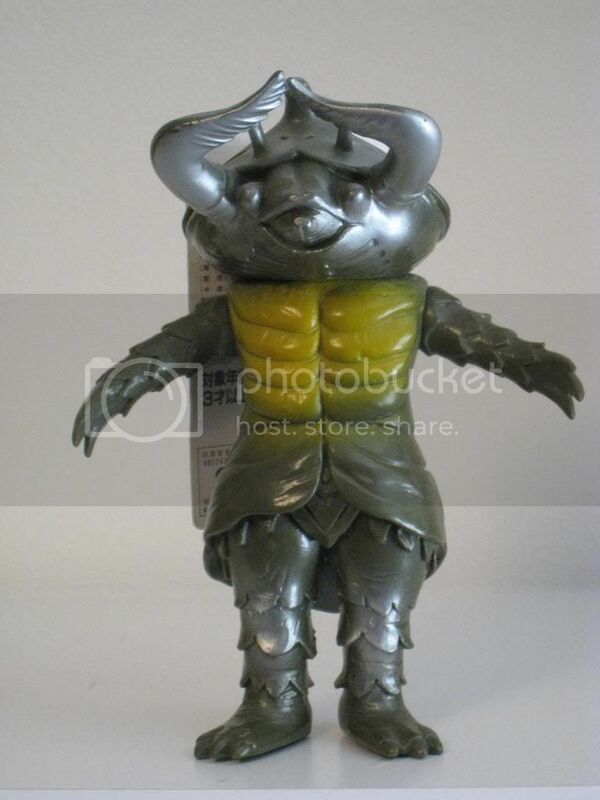 This is the only version of Antlar that's been cast in a pea soup shade of green/brown. It's painted in similar colors to the 2000 release, but the vinyl color (and the metallic blue on the mouth of the latter figure) makes it impossible to confuse the two. 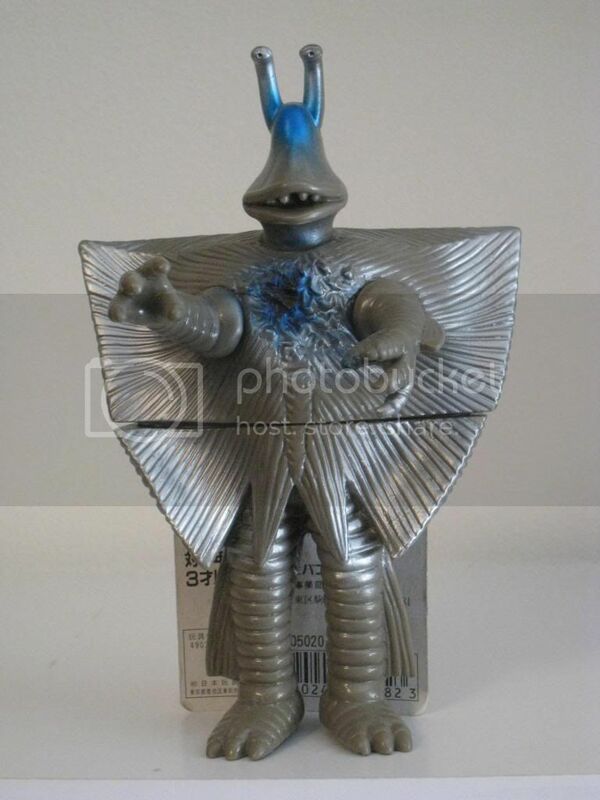 With the release of a brand new mold of the character in 2005 (for its appearance in Ultraman Max) this mold has since been retired. The Gyeron figures of the '80s present another example of a group of toys that are hard to tell apart. Dark brown vinyl with gold and black paint is the name of the game here. 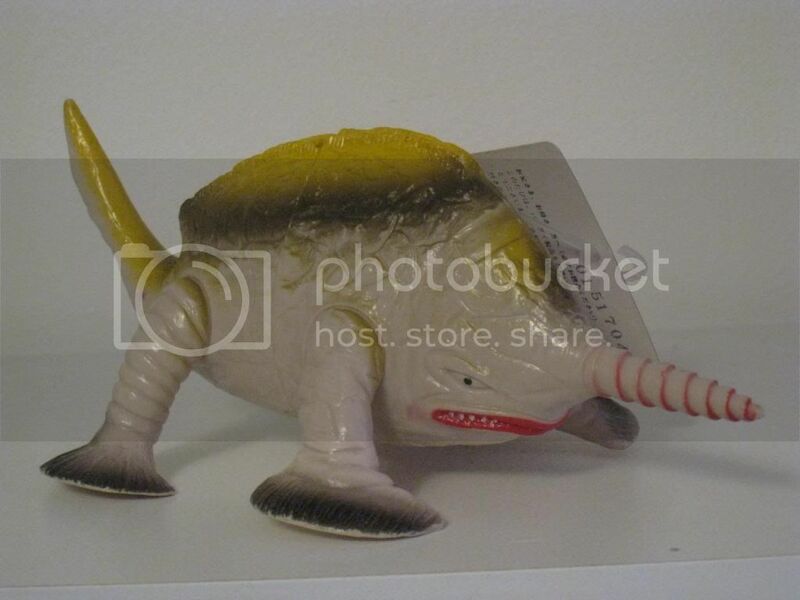 The 1991 edition uses similar paint colors, but switches the vinyl color from dark brown to light tan, a color combo that results in a very bland and unattractive-looking toy. This mold was replaced by a new one in 1995 which (oddly) was only used once. Interesting tidbit: the Gyeron figures have styrofoam inside of them in order to retain their shape. That's similar to the 1995 Memorial Box Rodan. 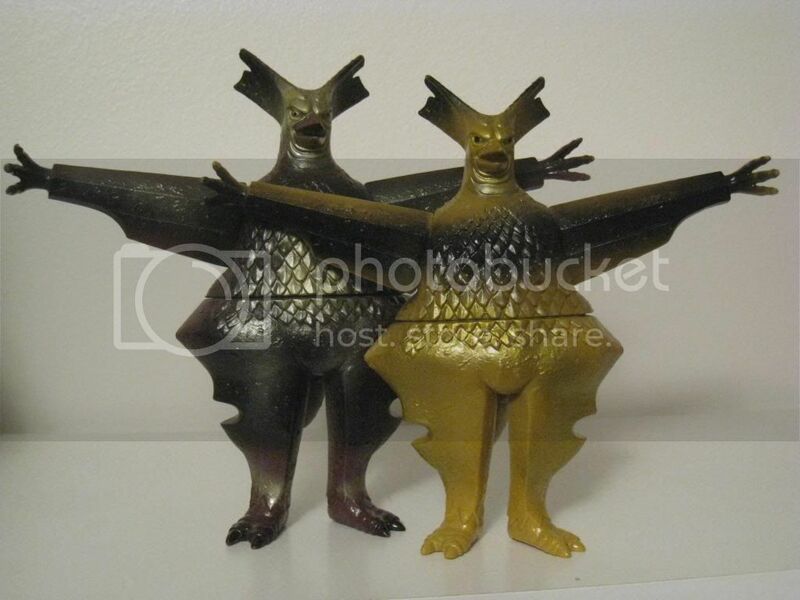 They also have heels molded to the bottom of their feet, also like Rodan. 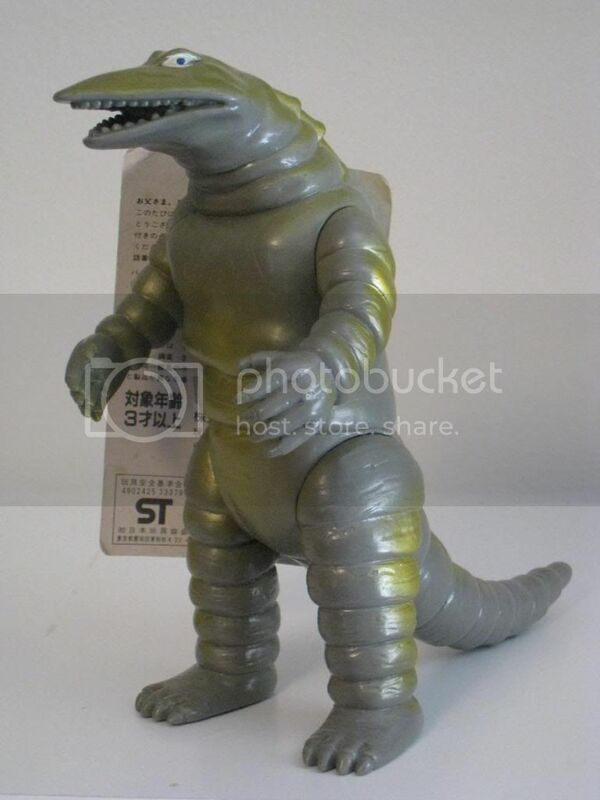 Yet another figure that's very easy to tell apart from earlier issues, the 1991 Kiylar toy is molded in a light gray vinyl and sprayed a minimal amount of silver paint. Much more appealing are it's '80s incarnations, which are all black with silver sprays. There's also an incredible size difference between the original 1983 figure and all later releases. 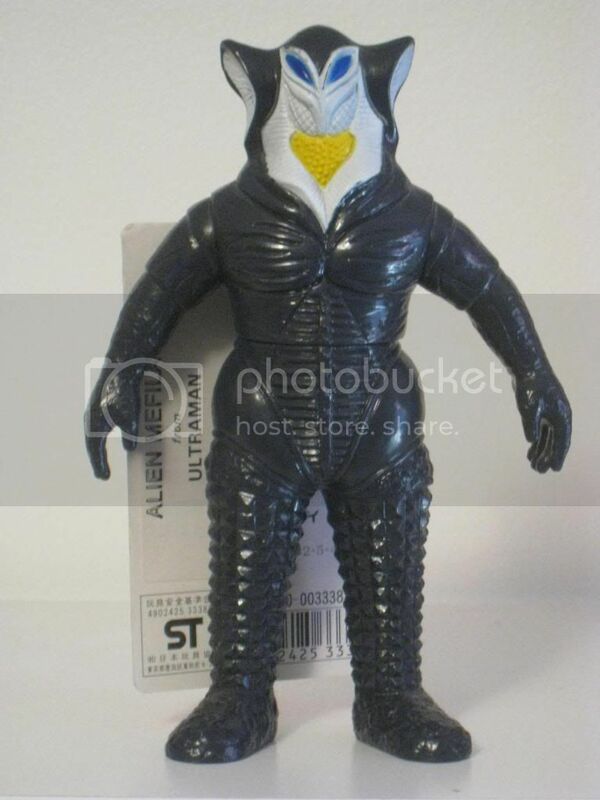 This was its last appearance in the Ultramonster line. I would have loved to have seen this guy last long enough to be given a nice, detailed paint job. 1983 and 1991 Gyeron figures. Note height difference. 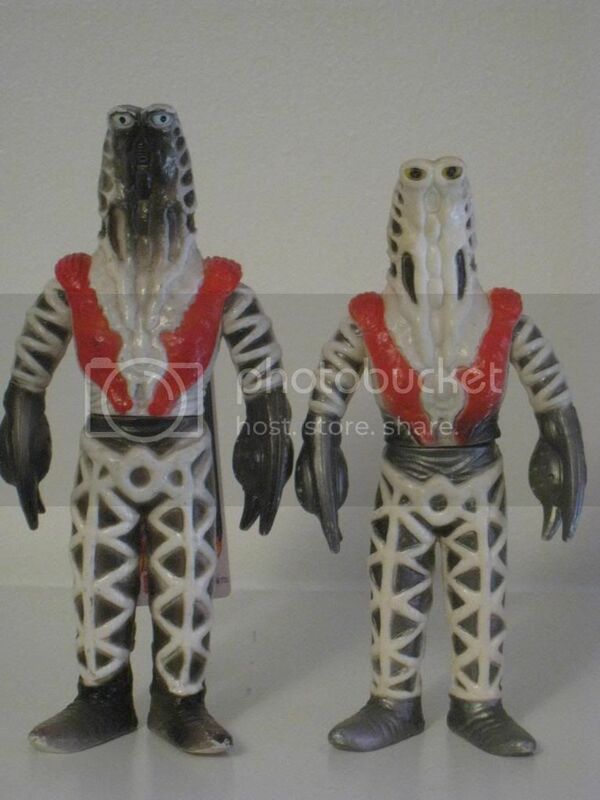 1983 and 1991 Kiylar figures. Again, note the extreme difference in sizes. 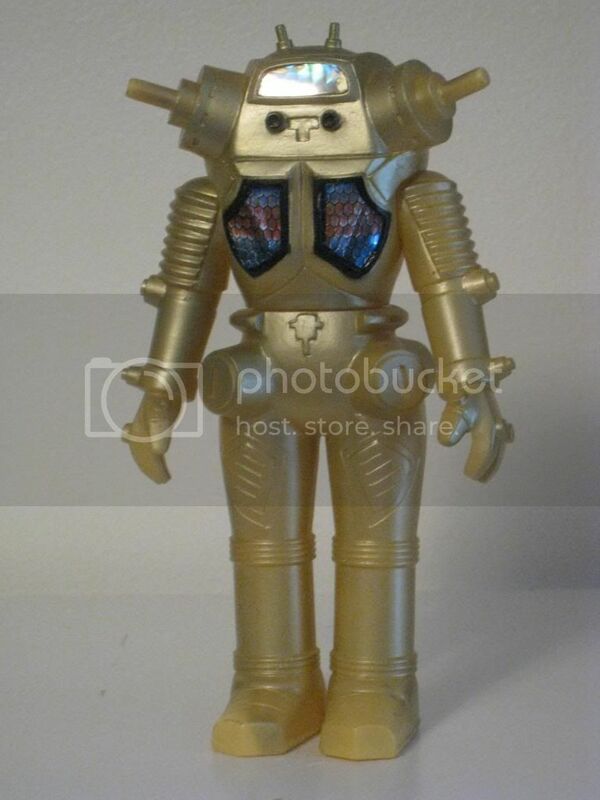 The 1991 Telesdon has a lot in common with the Kylar figure, in that it shares the same gold paint sprays as it's '80s brethren, but switches up the vinyl color to something a lot less eye catching. In this case it's molded in grey as opposed to brown, a color it would go right back to in 2000. Along with Black King, this is one of those figures that's crying out for a re-sculpt. Its most recent appearance (in 2008) was done in a matte vinyl. This figure presents the most drastic example of a toy that's not only colored completely different from its previous releases, but also suffers from mold alterations. 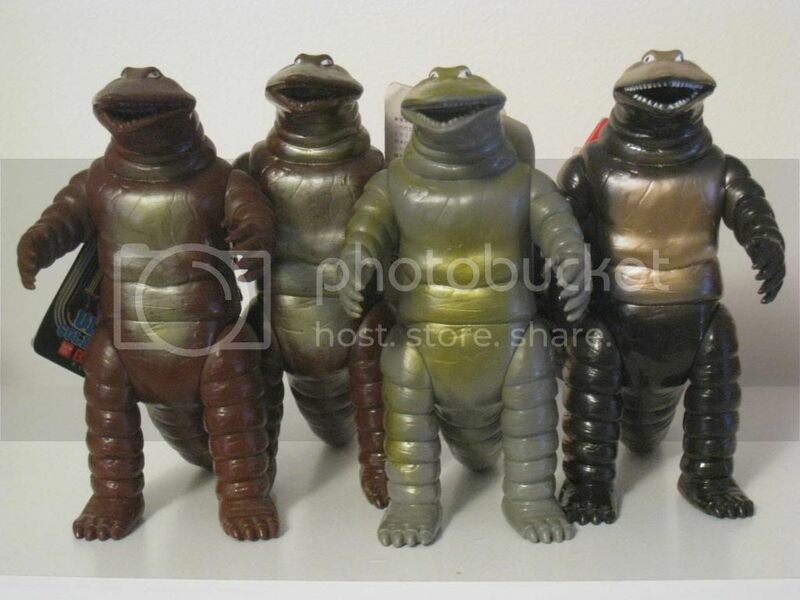 All older Neronga figures were made in a pale blue vinyl and colored with some really nice metallic green and purple sprays. This figure is entirely molded in purple, with some very basic yellow and green sprays down the back, resulting in a figure that practically looks like a bootleg in terms of ugliness. The overall size of this toy has also been shrunk drastically compared to the earlier releases. Most significantly, the tail has been shortened by about an inch. 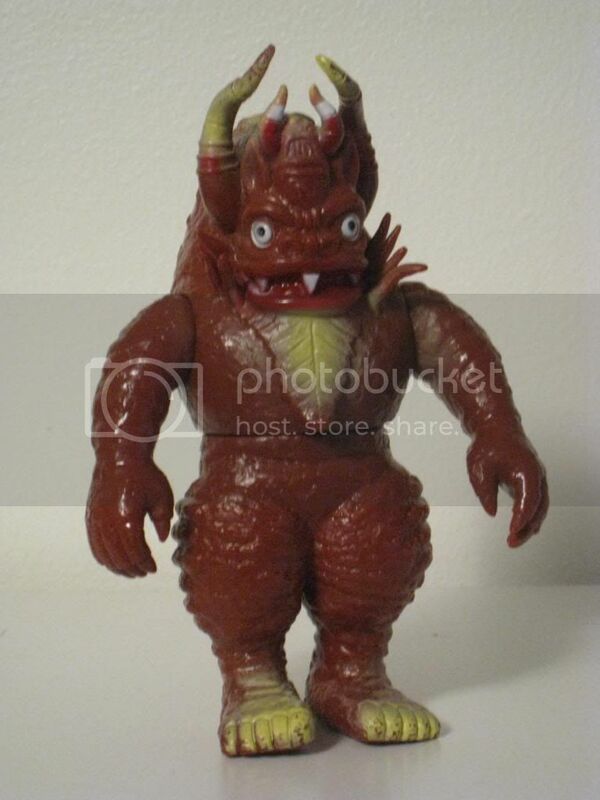 In 1995 Bandai finally bailed on this figure and sculpted a new one based on their 1992 Baragon toy. It's still in release to this day. The very first Geronimon figure was cast in black with some really appealing silver and magenta sprays. Throughout the rest of the '80s, this figure had the indignity of being cast in dark green with lots and lots of pink, which doesn't do justice to such a colorful character. The 1991 figure attempts to go back to what worked with the first release, casting the figure in dark grey with silver and magenta sprays like before. 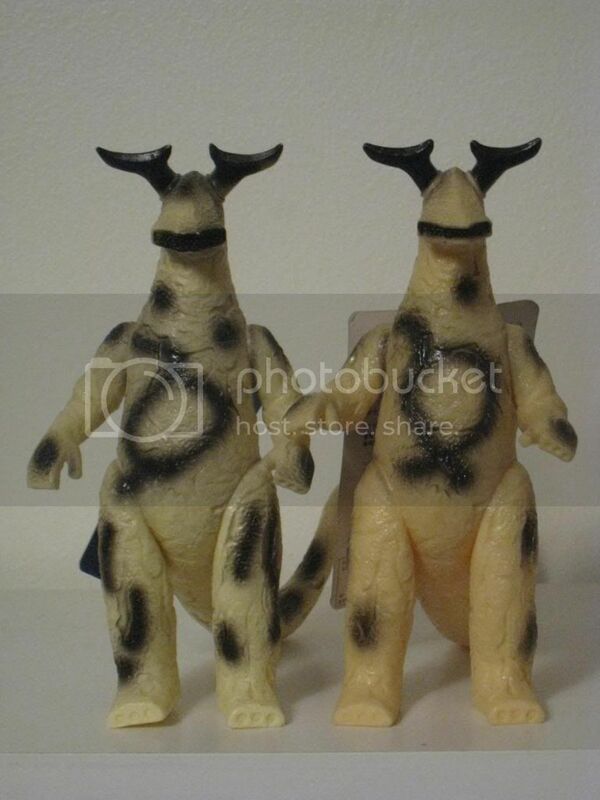 That makes it similar to the 1983 figure, so the way to tell those two releases apart is that the first release has silver spots on the body, while the body of the 1991 figure is completely unpainted. It was a step in the right direction but Bandai apparently knew they could do even better as the 1994 repaint of this toy finally gave it the intricate paintjob it deserved. The figure was retired after that, only to receive a brand new sculpt in 2007. 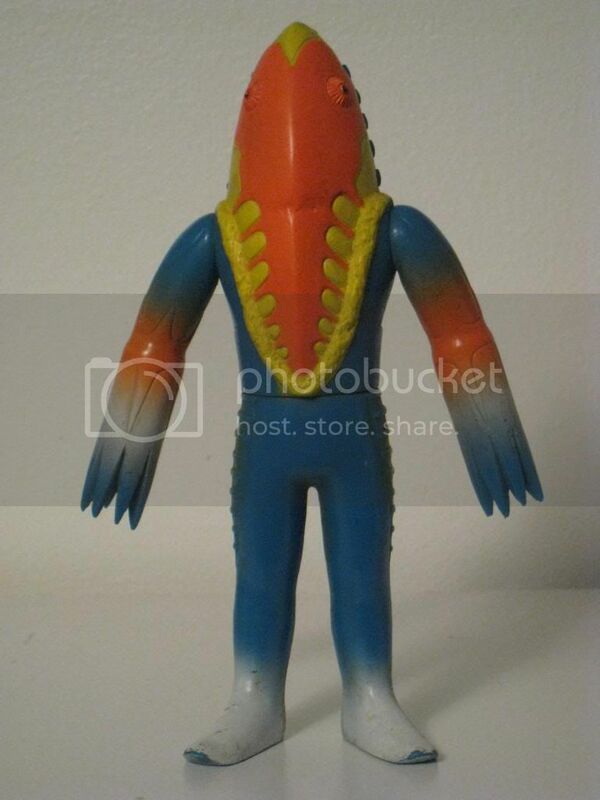 The prankster monster Gyango is one of the most unique Ultramonster figures thanks to the intricately painted, multi-color design on its neck, chest and stomach. It's appealing enough to almost disguise the fact that the figure is even less accurate than Marusan's original 1966 toy. However, it's this multi-color design that makes it possible to tell the 1991 version of this figure apart from its '80s incarnations. While the red, white and blue colors remain the same from the '80s figures, the brown paint has been replaced by orange, resulting in a more eye catching toy. The vinyl is also slightly darker on the 1991 toy, but that's something you really can't see unless you compare the figures in person. This toy has since been retired, but here's hoping it's cult popularity inspires Bandai to bring him back someday. Another figure whose charm is in its child-like, early '80s simplicity, the 1980's Bemular figures are all cast from a dark green base vinyl with various black, silver and magenta paint sprays, making them tough to tell apart. Like many 1991 figures, this Bemular drops the darker base vinyl and goes with a light grey vinyl color. The paint sprays are a very simplistic black and non-metallic magenta, causing the figure to lose any appeal it might have had. 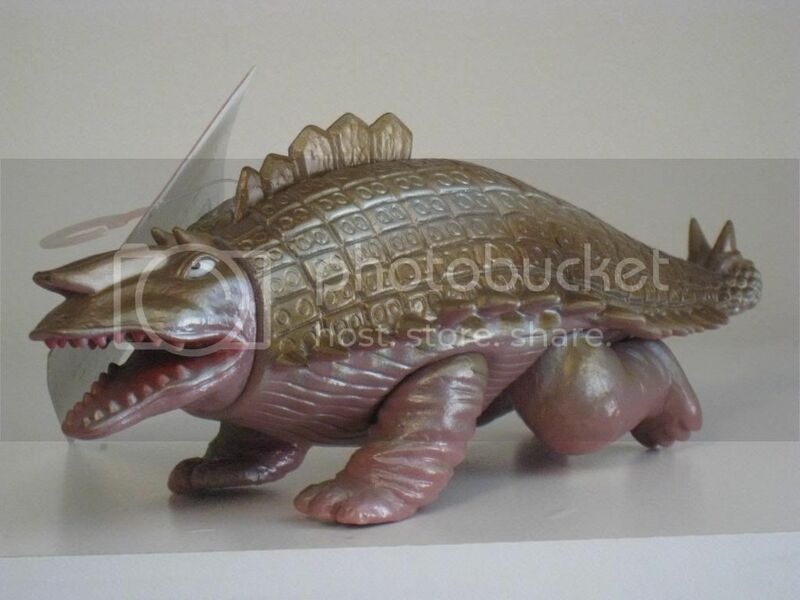 Like Neronga, Bandai ditched the sculpt after this and it's 1995 resculpt was a true masterpiece by comparison. The 1989 and 1991 Gandar figures differ from their '83, '86 and '88 releases in one very important way. The arms on the early figures had a habit of collapsing into the torso thanks to the body design. The 1989 issue corrected this by adding a thick rim of vinyl around the base of the arms, insuring that this wouldn't happen again. So that said, the best way to tell apart the '89 and '91 versions is by the paintjob. 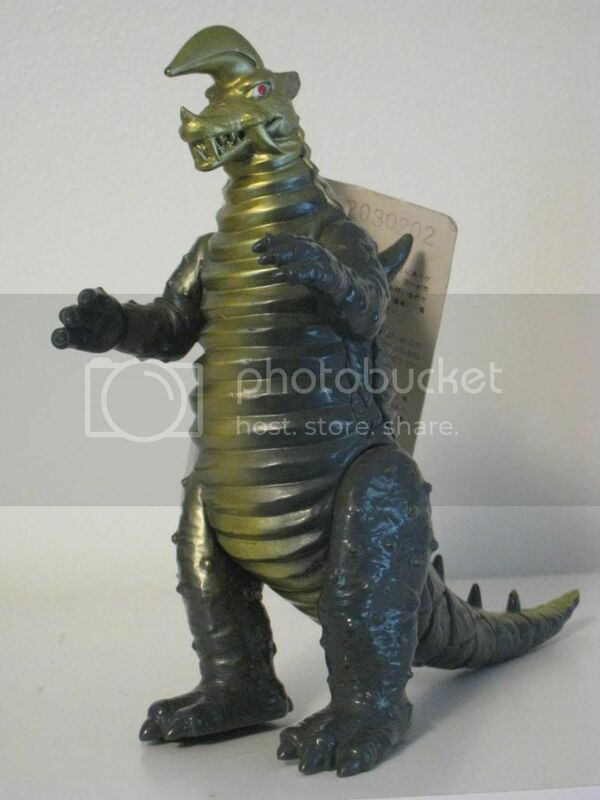 The 1989 figure is absolutely bathed in silver paint, with some nice metallic blue added in. The 1991 figure limits the silver to the very edges of the body and is far more stingy with the blue paint. 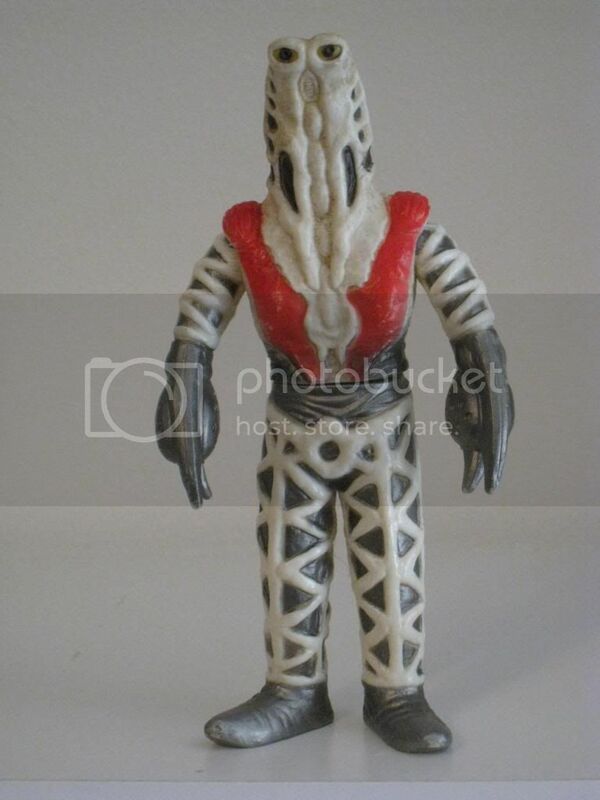 Gandar would not be issued again, which is a shame seeing as it's such an appealing, underrated figure design. 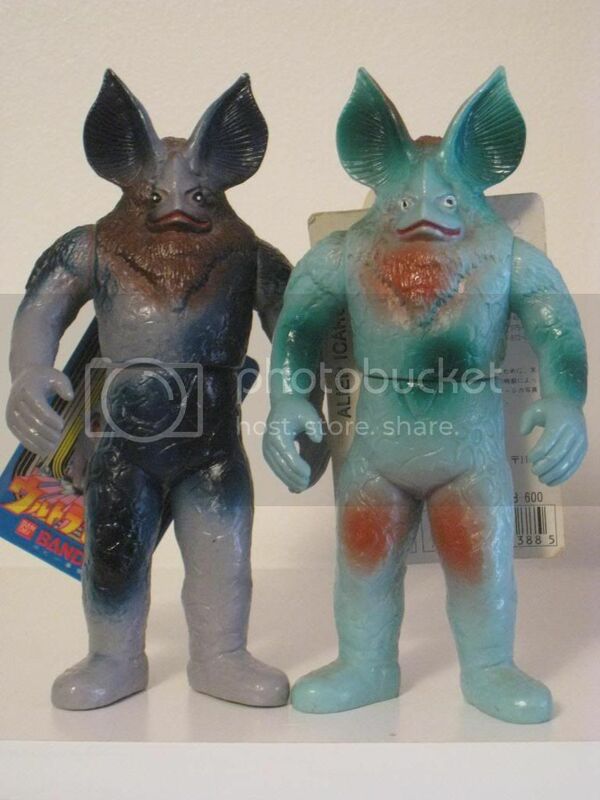 1983 and 1991 Bemular figures, showing differences in height. In its one and only appearance, Seabozu was desperately trying to find its way back to the Monster Graveyard. This figure looks like it's trying to find its way to a competent paintjob. 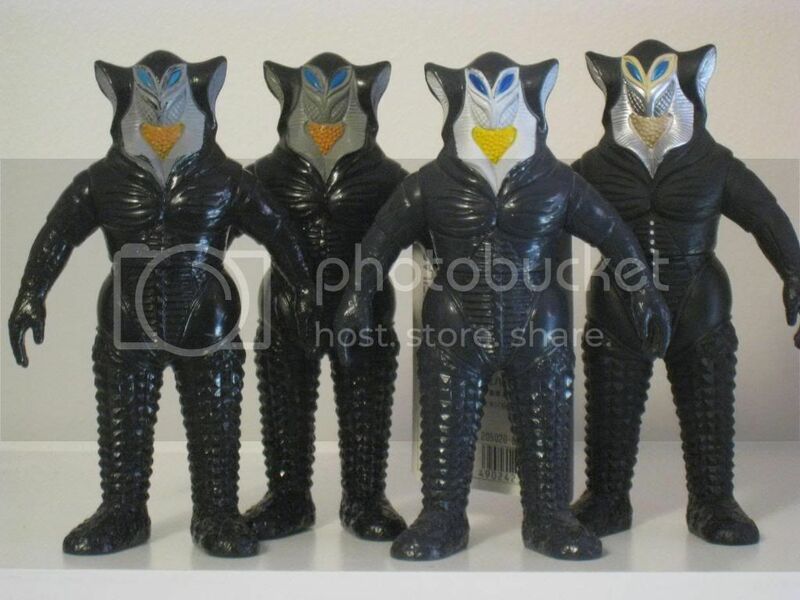 The original Seabozu figure was an interesting combination of pinks, silvers and blacks. The figure than spent the rest of the '80s cast in black vinyl with minimal white highlights, which makes no sense at all considering the monster's boney nature. The 1991 figure decided to take these colors and flip them, with absolutely no care to how bland it would make the figure look. Luckily later releases would go out of their way to give the toy a more intricate paint job, with the figure being silver in 1994 and bone white in 2000. The easiest way to tell the 1991 Godola figure from its earlier releases is to look for any black sprays on the head. There shouldn't be any on this issue, and the predominant color on the feet, waist and claws should be silver. If there's a lot of black paint on your Godola, it's not a 1991 release. 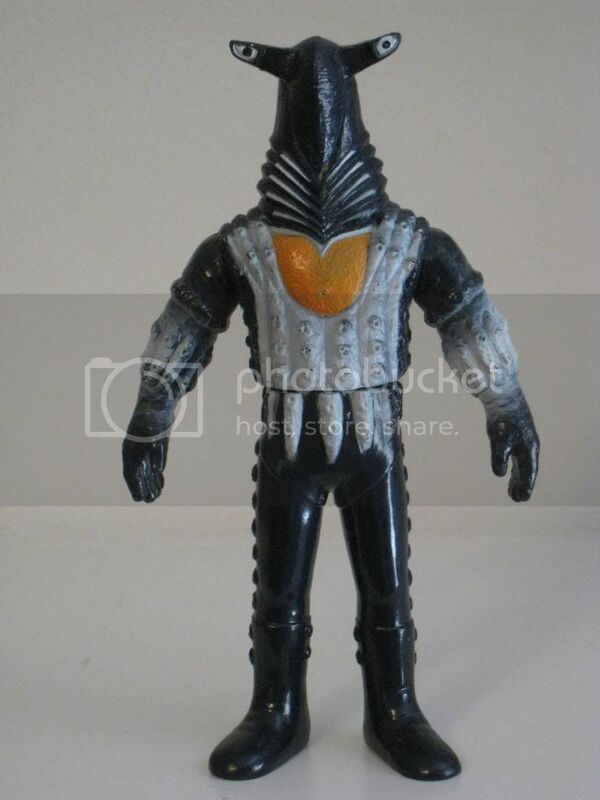 A relatively minor Ultraseven alien, this would be this character's last release. 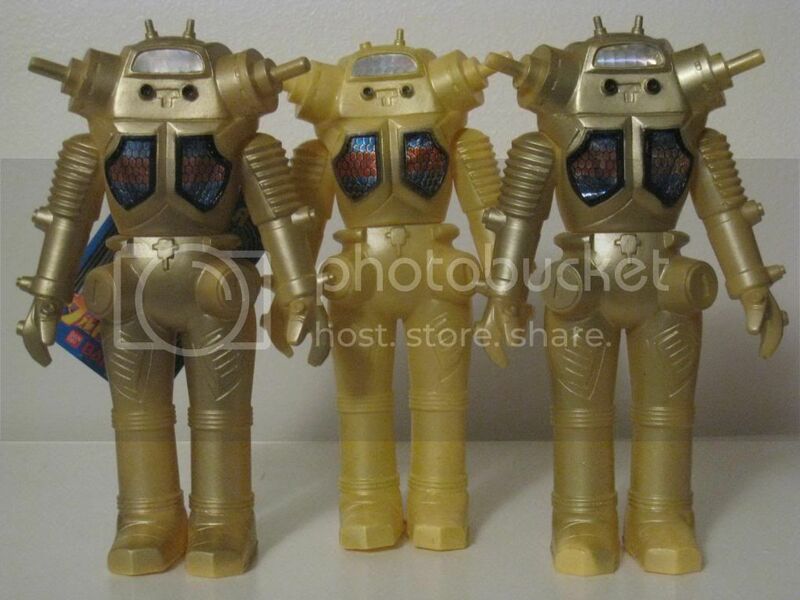 The '86, '88 and '89 Micras figures are all easily distinguishable from the original '83 release by way of vinyl color, which is dark brown instead of yellow/orange. The 1991 release, on the other hand, goes for a lighter red/brown vinyl. This figure would be replaced by a repaint in 1994 which goes back to dark brown, but is painted with more detail. After a 2000 release done in chocolate brown, this figure was finally retired to make room for a new Micras sculpt in 2006, to tie in to Ultraman Mebius. From l to r: 1983, 1986, 1991, 1994 and 2000. Again, not the extreme height difference between the '86 and '91 figures and everything else. It's easy enough to tell the 1991 Metron release from everything else that came before. The blue base vinyl is a lighter color and the paint has gone from red to orange. Simple as that. 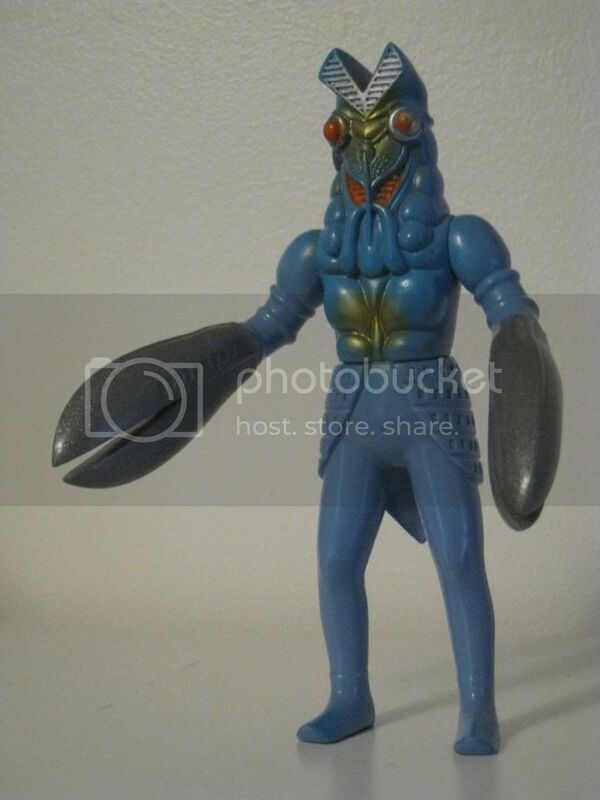 Metron was given a new sculpt in 1994 and even though another new mold was created for Ultraman Max in 2006, the second sculpt continues to be used by Bandai, with the most recent release being put out in 2012. At first glance every release of this guy seems to look the same, obviously excepting the 2007 version, which is made from a matte vinyl. The best way to tell if your Mephilas is a 1991 edition to look at the face. A '91 figure should be painted with bold yellow on stark white. All previous releases have grey paint on the face. The vinyl on the 1991 figure is also a few shades lighter than the older figures, appearing more dark grey than jet black. The 1991 Icarus figure is another easy one to tell apart from its '80s releases. All the older figures were cast from a dark grey/blue vinyl. The '91 figure is made from a much more vibrant light blue/green. This was the final time this mold would be used. It was replaced with a resculpt in 1995, which was retired after its 2000 re-release. 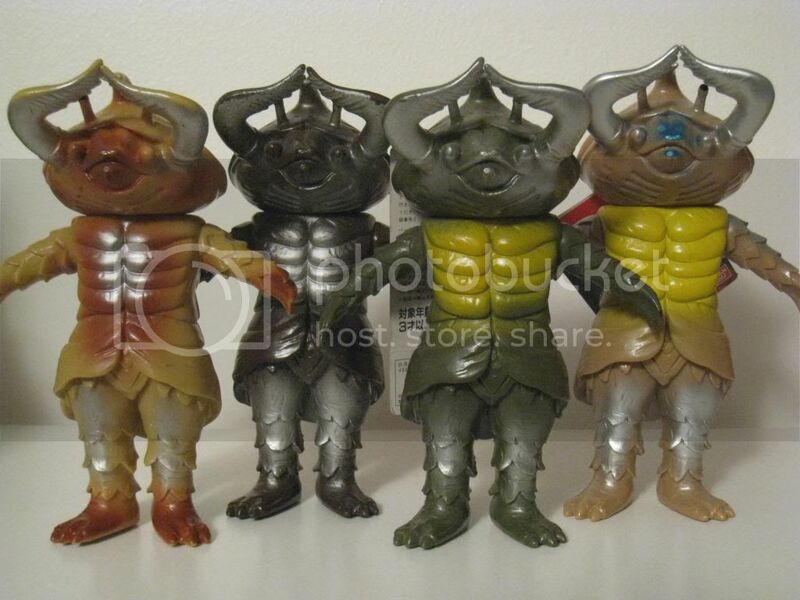 It has always surprised me that Bandai didn't do a remold on the Max Metron mold to remove the stitching and keep the otherwise superior mold around to represent his Showa self, but I guess unlike Gomora he didn't merit such treatment. I own the 2007 or '08 release of that second Metron, and I've never been entirely satisfied with the strange leg pose. A lot of Pegassa figures have vaguely similar paint jobs. Some have more white paint than others, while others have blue spray that some others lack. The absolute easiest way to tell the 1991 (and final) Pegassa figure apart from all the others is with the colored section on the chest. On the 1991 figure it's painted light orange/yellow. On all other figures it's painted a deeper, reddish hue. A generally underwhelming toy. The original Bandai Windam figure was never anything special in terms of sculpt, but at least all the '80s releases painted the toy with some cool metallic greens and blues to make up for that. None of that is on the 1991 release. It's just simple silver on grey. These 1991 releases sure love grey. Windam would be retired after this release, and wouldn't return in vinyl form until Ultraman Mebius, in 2006. Another figure that's very easy to tell from its older incarnations thanks the color of its vinyl. All the older Skydon figures are cast in pale blue. 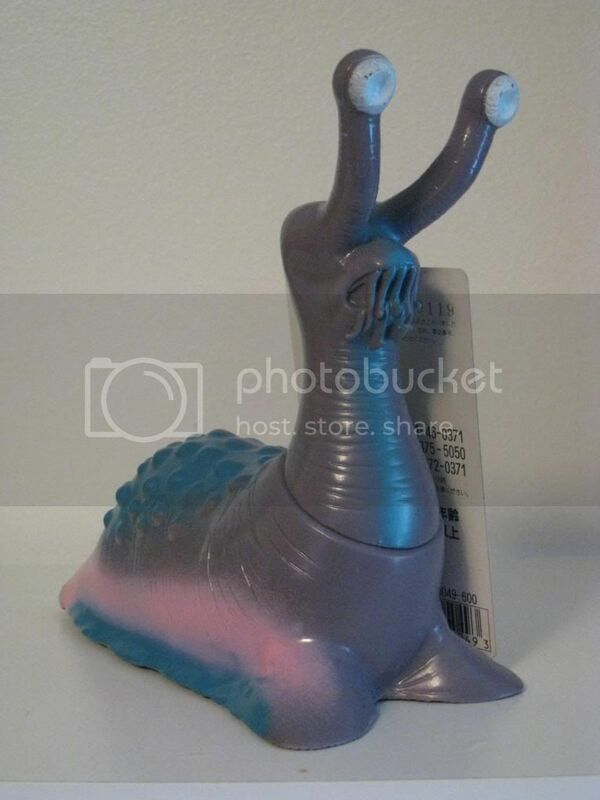 The 1991 figure is molded in pink instead. Certainly better than grey, right? 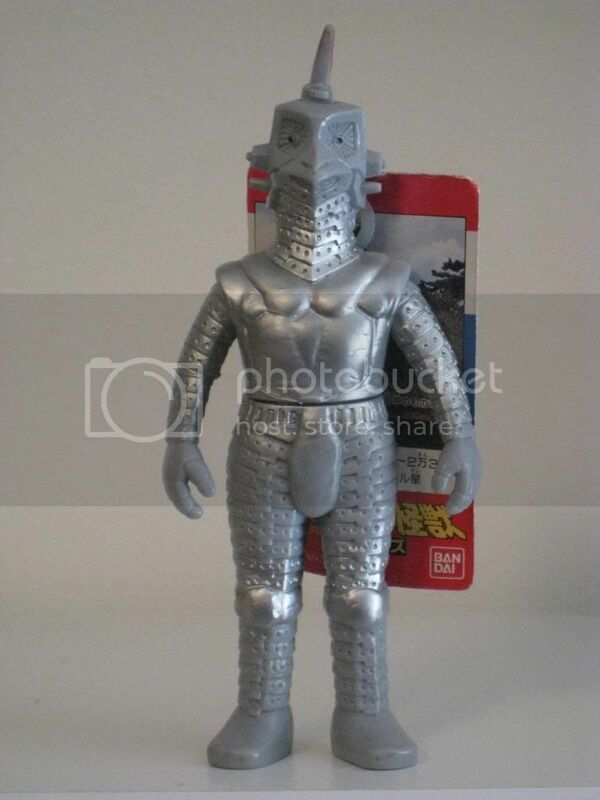 An appealing and overlooked little toy, this would be the last time Ultraman's heaviest foe would be issued by Bandai. Your guess is as good as mine on this one. Bandai was remarkably consistent with their Dorako figures. Every single one of them looks exactly alike. Unless it has a tag it's practically impossible to tell each issue apart. 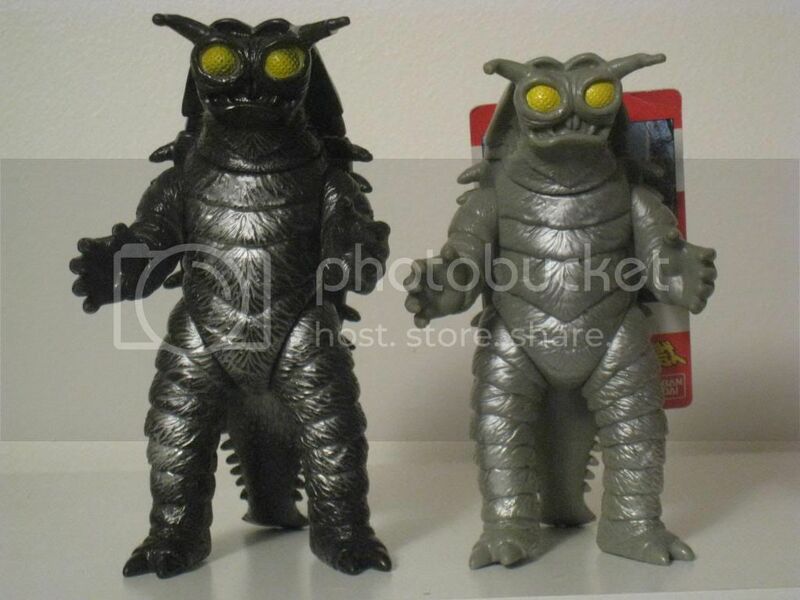 That said, I think the big question on everyone's mind is why Bandai went with the blander revived version of the monster, and the not the original clawed and winged version. Imagine how much cooler that would have been. There's no mistaking the 1991 Gubira from any other release. Every '80s variant had some sort of green paint sprayed on the back of the toy, with the 1983 version having both the darkest green color and the most overspray. There is no green whatsoever on the '91 figure. Instead we have yellow and black sprays. It's the most accurate coloration, but oddly also the blandest. 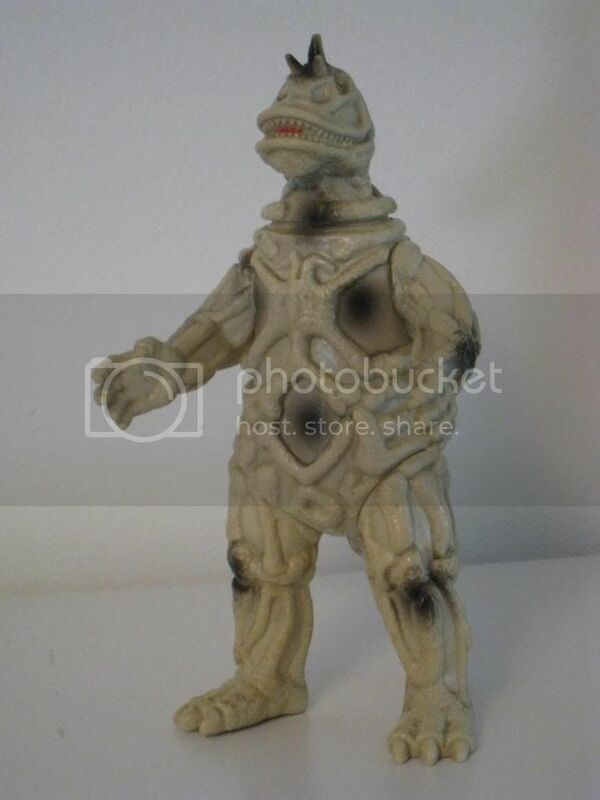 Although the figure would be retired after this release, Bandai would return to the character twenty years later with a brand new mold when the monster return for the movie Ultraman Saga in 2012. 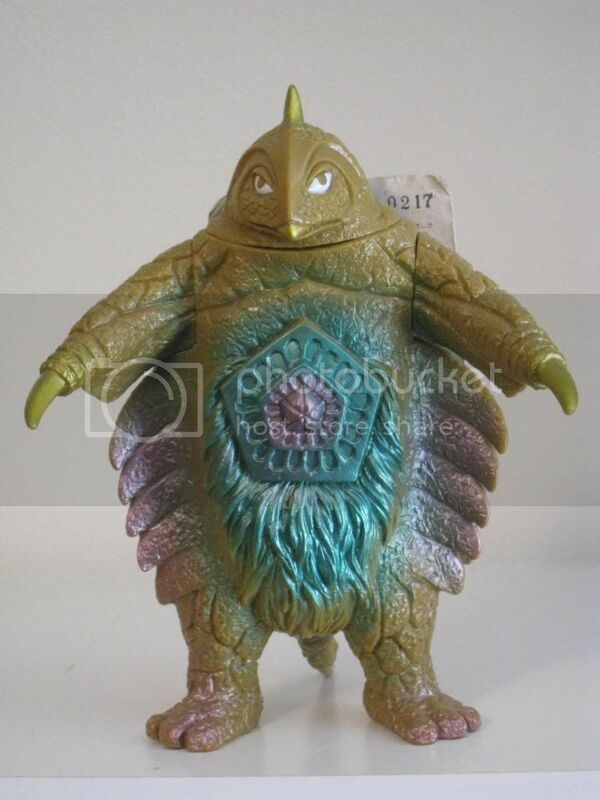 Essentially a two-section lump a vinyl depicting a big, ugly slug, the Bandai Namegon is one of the most visually unique toy in the entire original line. All the '80s incarnations of this toy are generally interchangeable, with blue and dark brown paint sprays on a grey base vinyl. 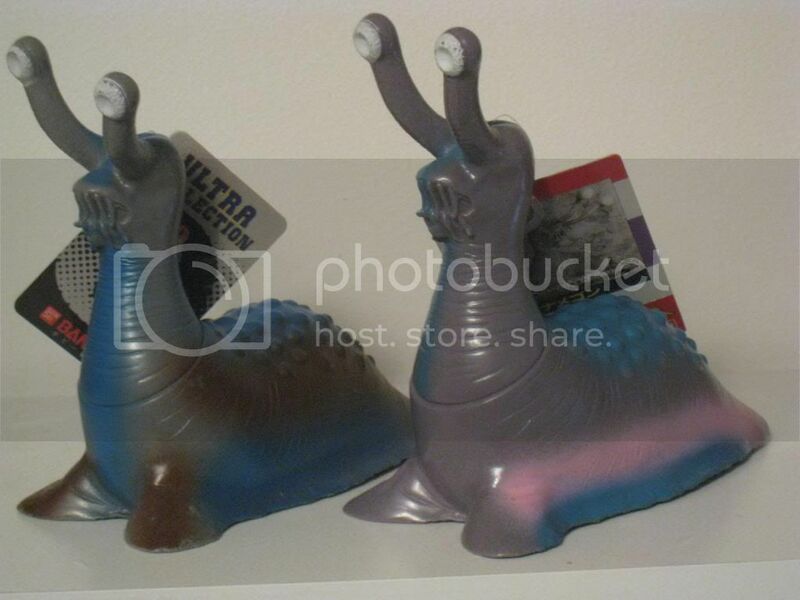 The 1991 version uses the same shade of blue but couples it with a bright pink spray on a lavender base that pops far more than the earlier paint schemes. Retired after this release, Namegon would later find new life in 2011 with a brand new, very limited edition figure celebrating Ultra Q's release to blu-ray. 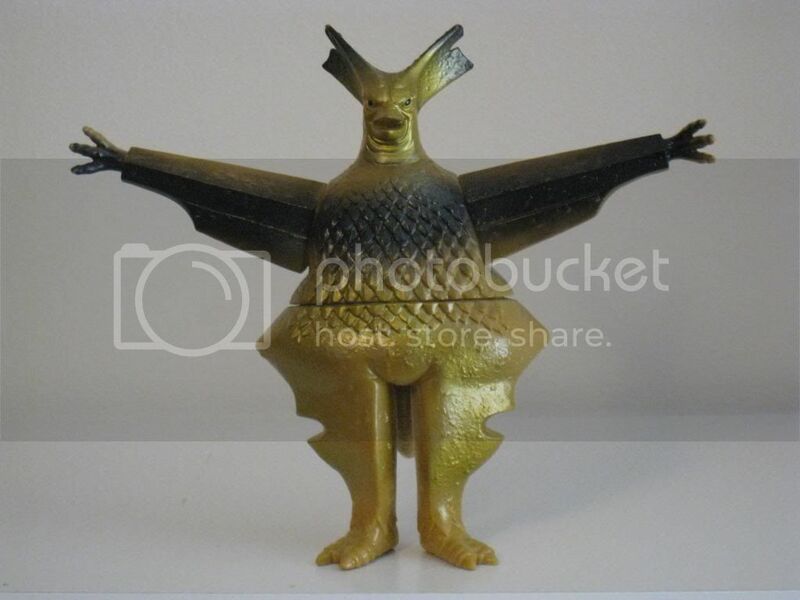 did they ever release the clawed/winged version of Dorako? klen7 wrote: did they ever release the clawed/winged version of Dorako? Other companies have, but not Bandai. I assume Bandai in 1983 went with the less complex and easier design despite the inherent coolness of the original Dorako. It's the kind of design I bet they could do with ease of late, but would need more incentive, like another major appearance in a series or movie. I wonder how close we came after the Ultra Galaxy NEO appearance. It's a shame the newer Ultra Q Blu-Ray tie-ins are more of a pain to get. I would have loved to add the 2012 Namegon or Garamon to my collection.